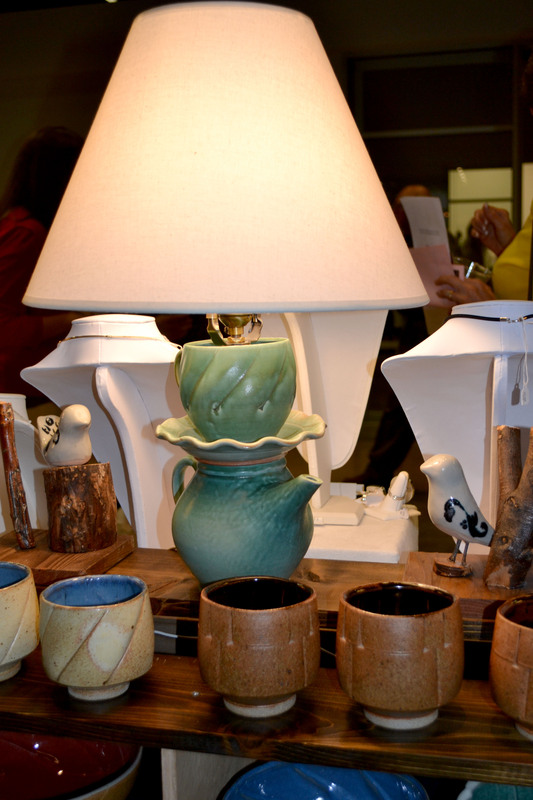 This weekend is the Craft Guild of Dallas Fall show! 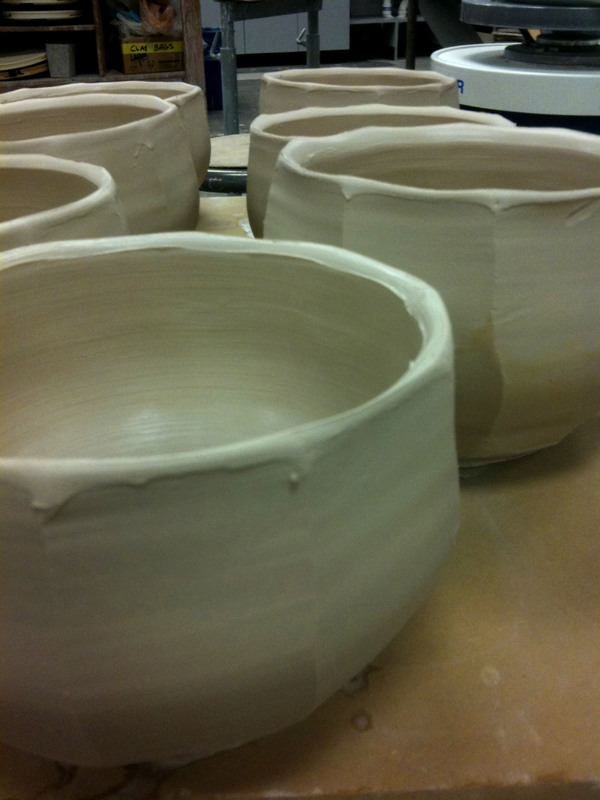 I contributed a lot of work for the last salt firing to get ready for the show. 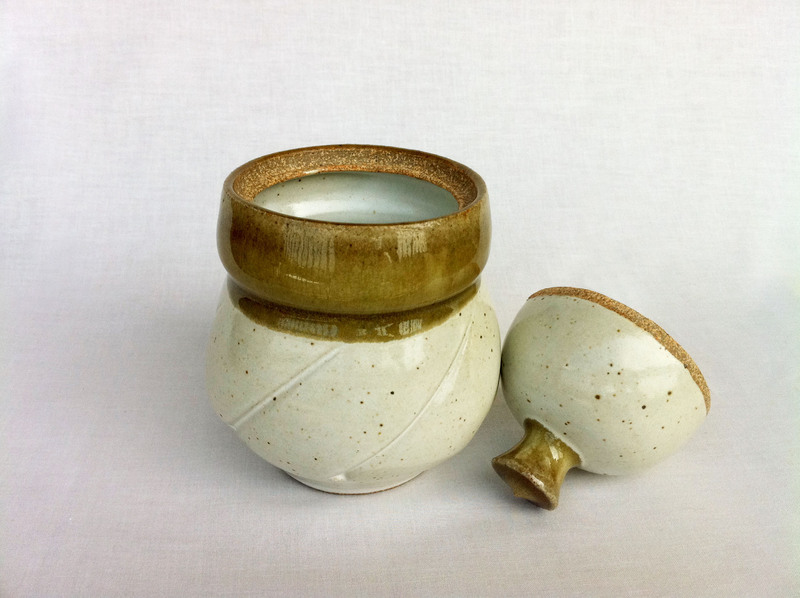 It is called salt firing because we literally throw salt in the kiln at the end of the firing when it has reached temperature. 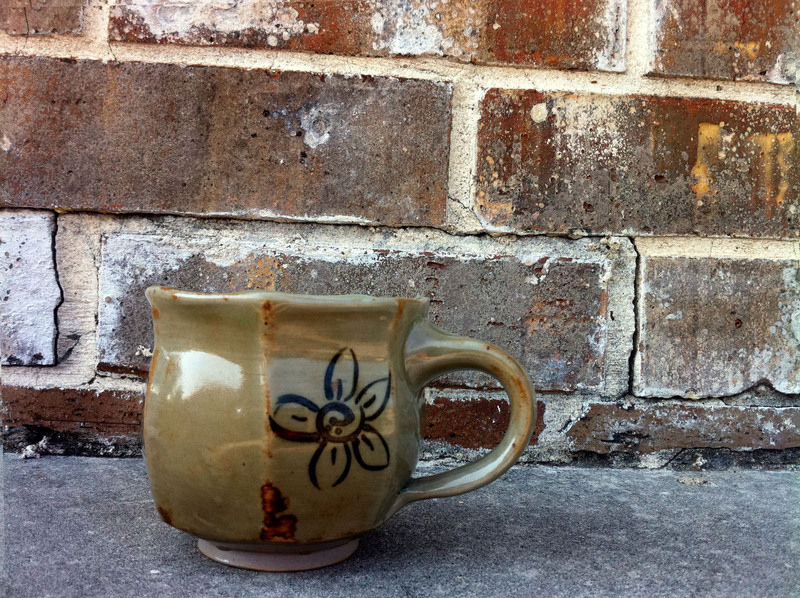 The salt adds a flair to each piece, but also reeks havoc on the kiln shelves and walls eating away at the bricks. Before the kiln can be loaded the shelves need to have the old salt scraped off of them and painted with kiln wash. Then wadding (basically a powdery clay) is mixed up and made into little balls to glue to the bottom of each piece to prevent them from fusing to the shelf, but can be knocked of the piece at the end of the firing. 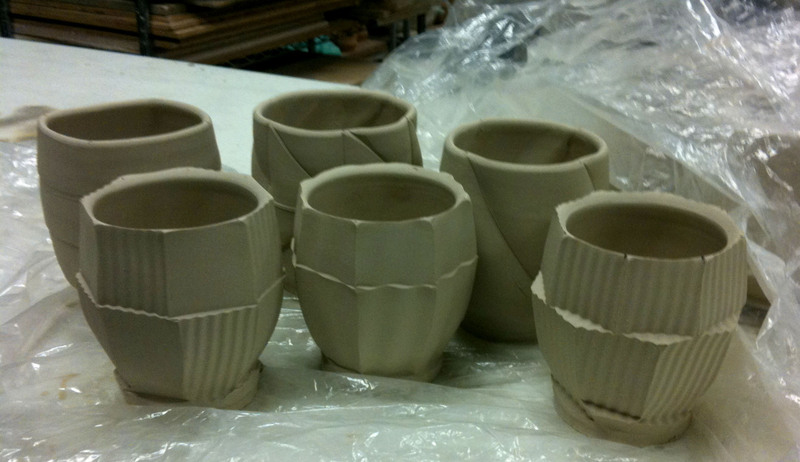 For this firing I did all the prep work and loading which took a few hours. I did get some help putting up the higher shelves since they are quite heavy and I did not want to send them crashing down on everyone’s work! 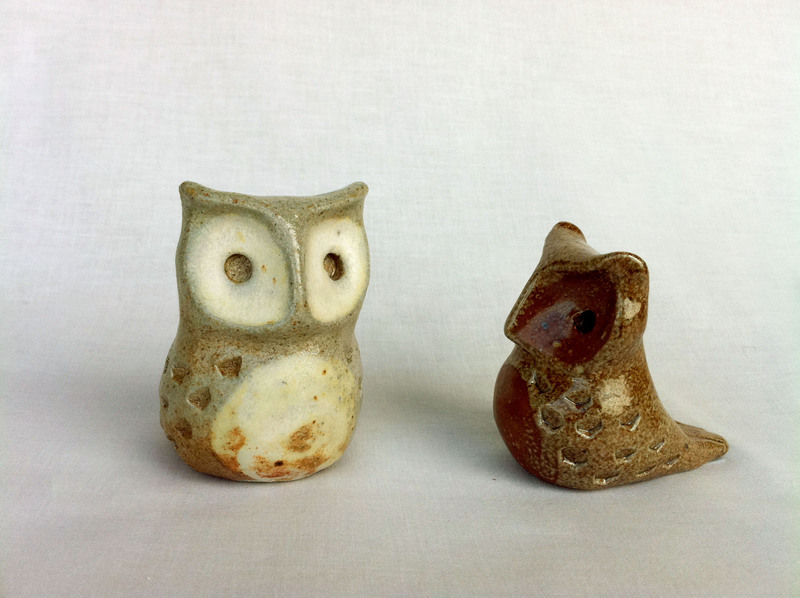 James fired the kiln and put lots of salt so I got some great stuff! 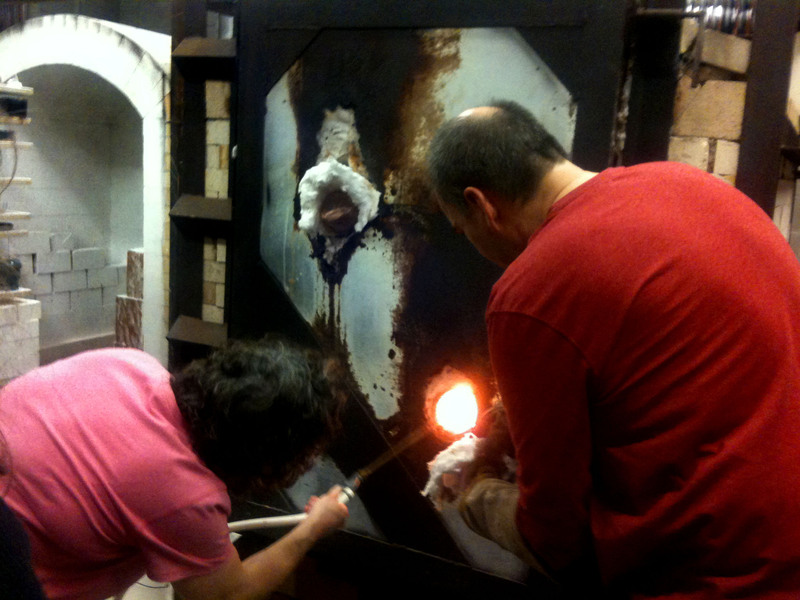 This is a picture through a whole in the door where we can peek to check the temperature of the kiln. 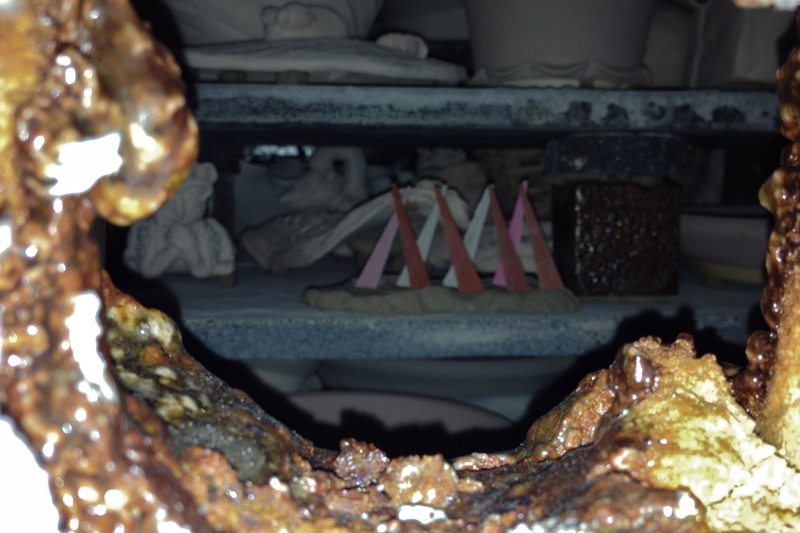 The triangular cones melt and bend at certain temperatures so we can check different areas of the kiln. 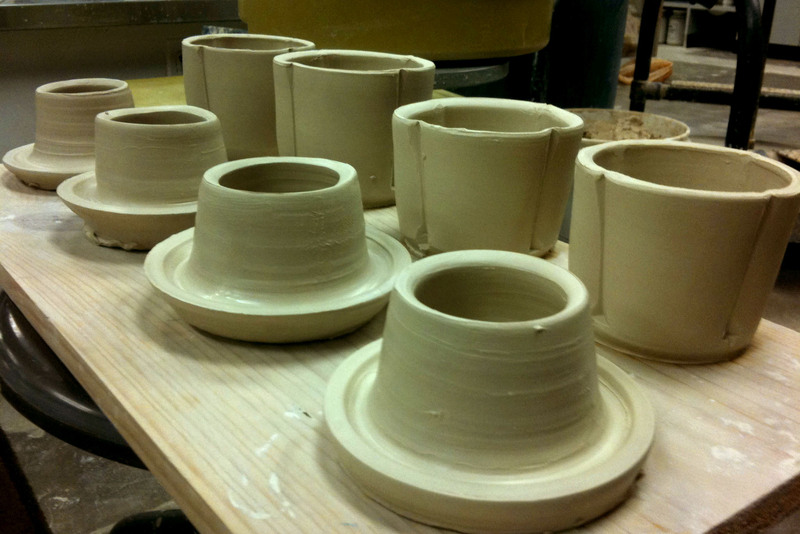 Here is a picture of the kiln after I was finally done loading! 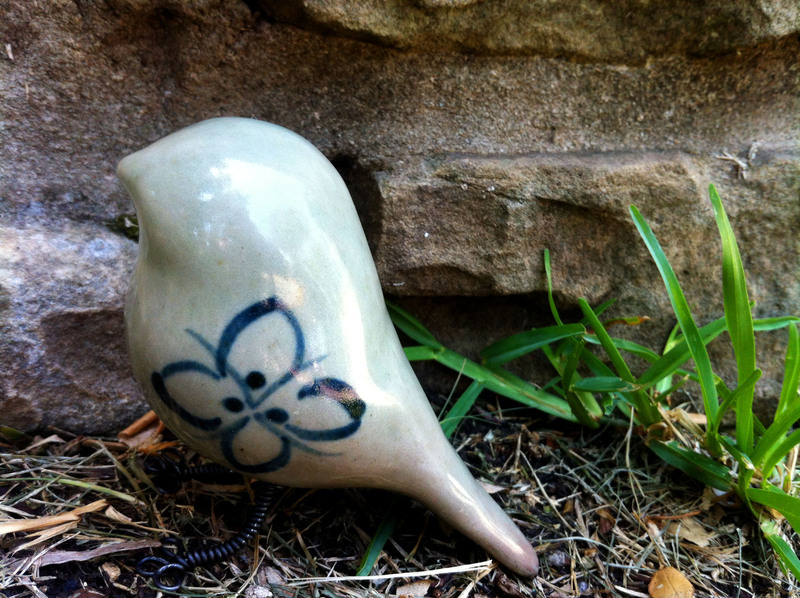 Now I just had to be patient for the kiln to be fired and cool off to see what the pieces will look like. 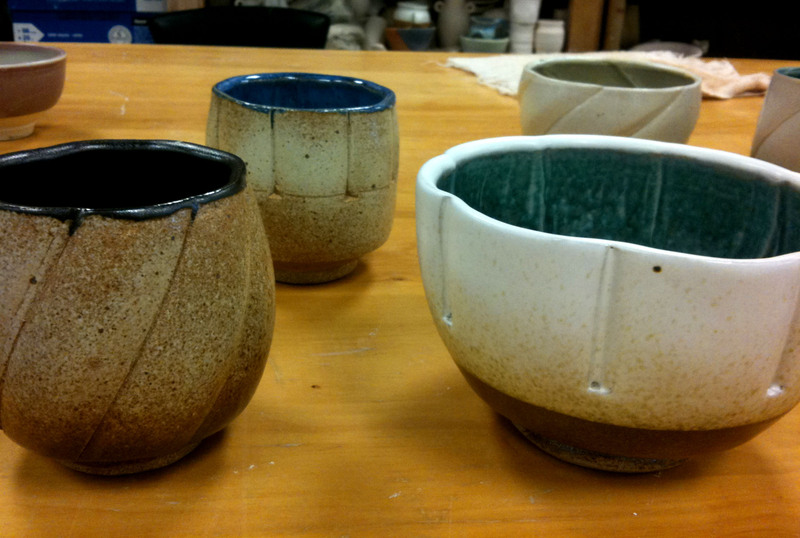 Below are some pictures of the finished pieces! 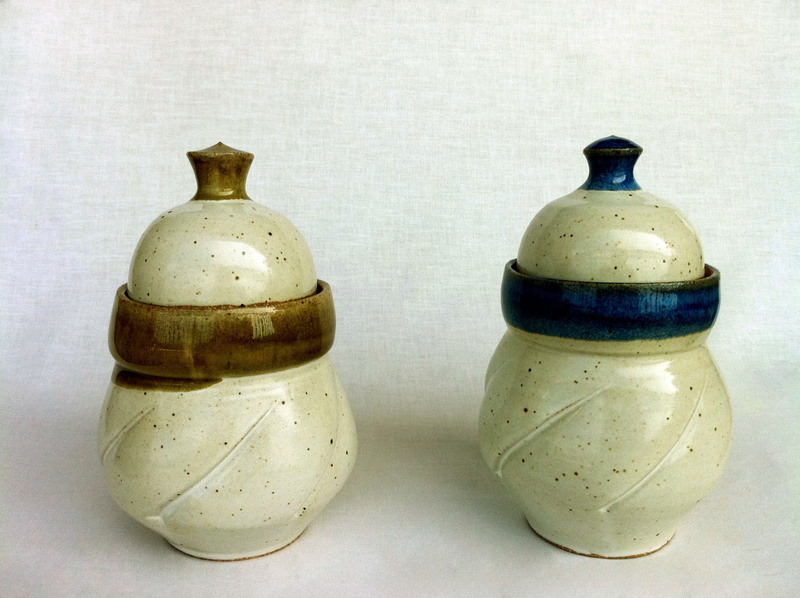 My current project making French butter dishes was inspired by a friend of mine who asked me to make her one. 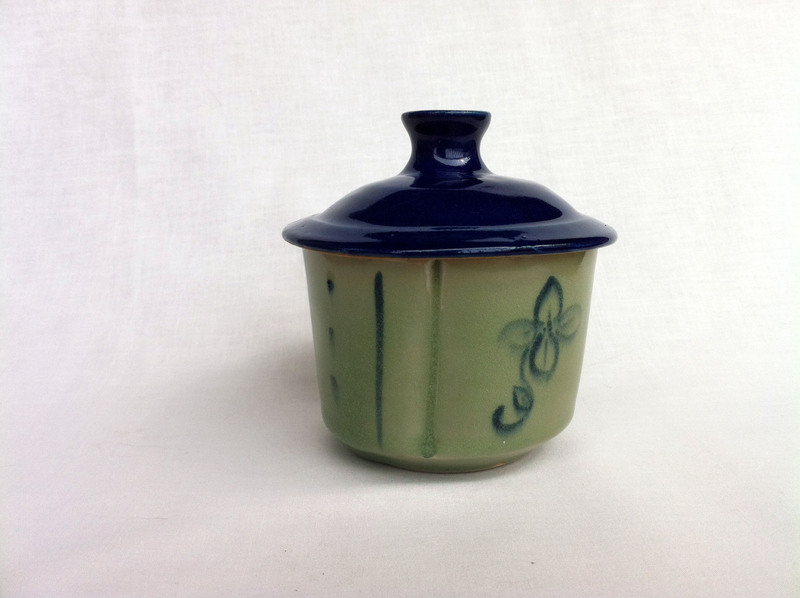 I had never heard of French butter dishes before, but decided to give it a try. The French have apparently created a jar that allows them to leave their beloved butter safely out of a refrigerator. 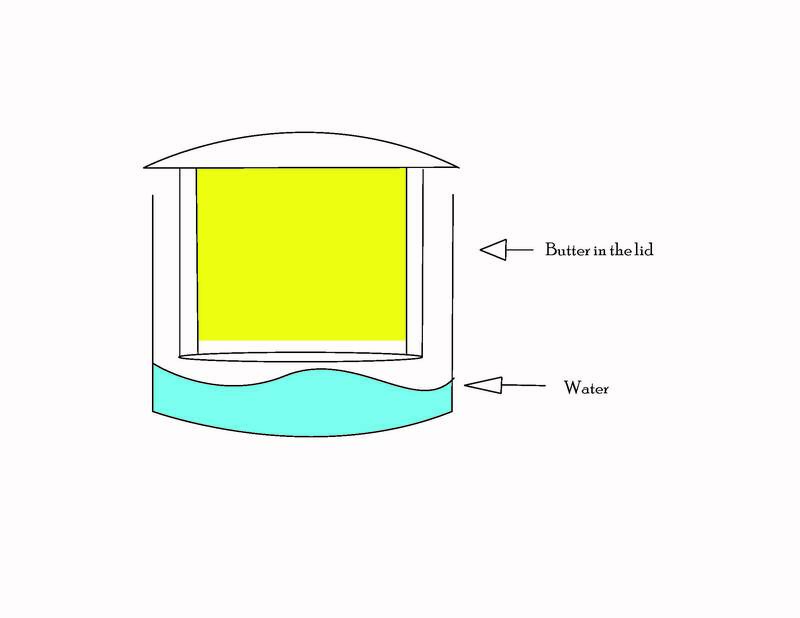 An air tight seal is created by storing the butter in a large gallery in the lid and submerging it in water at the bottom of the jar. The diagram below is a helpful visualization. 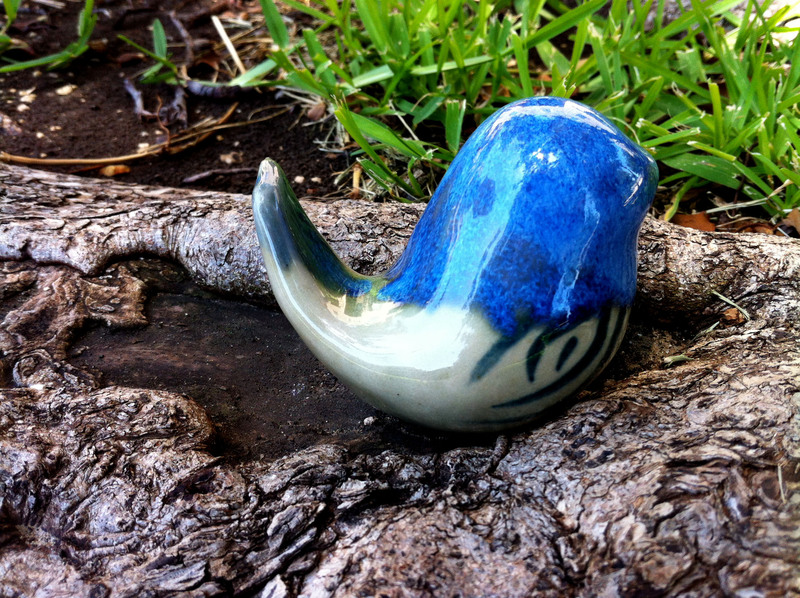 The jar is pretty easy and is just thrown with a flat bottom. I threw the jars with flat sides and added my regular decorating favorite of ruffles. 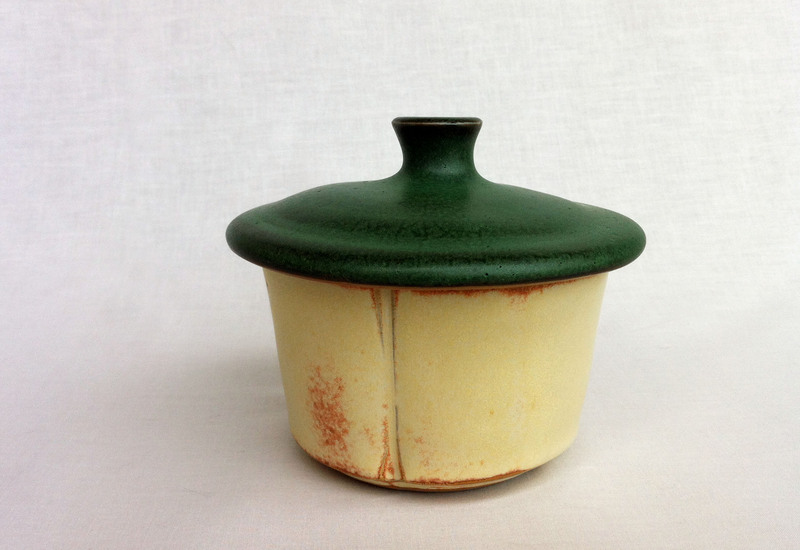 The difficult part of this piece is the lid. The pictures online made the lid look deceptively easy. 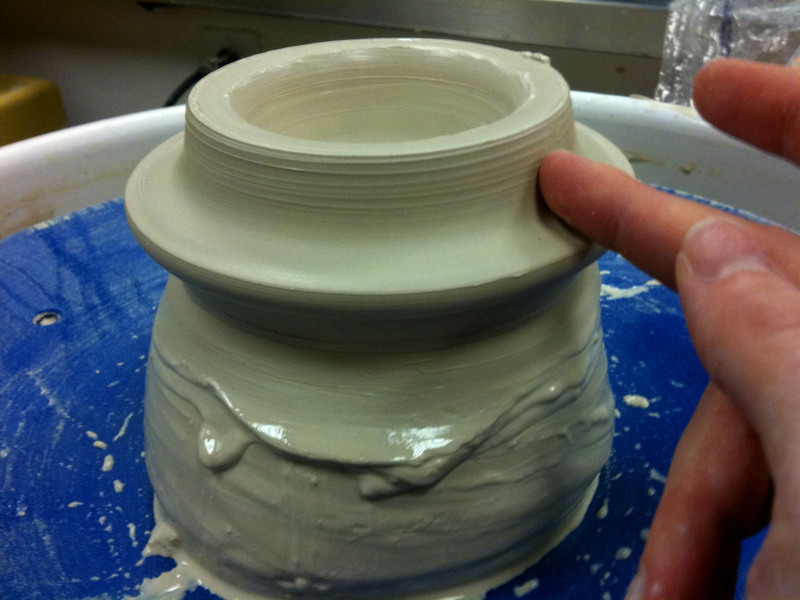 Lids are frequently made throwing “off the hump” on the wheel. 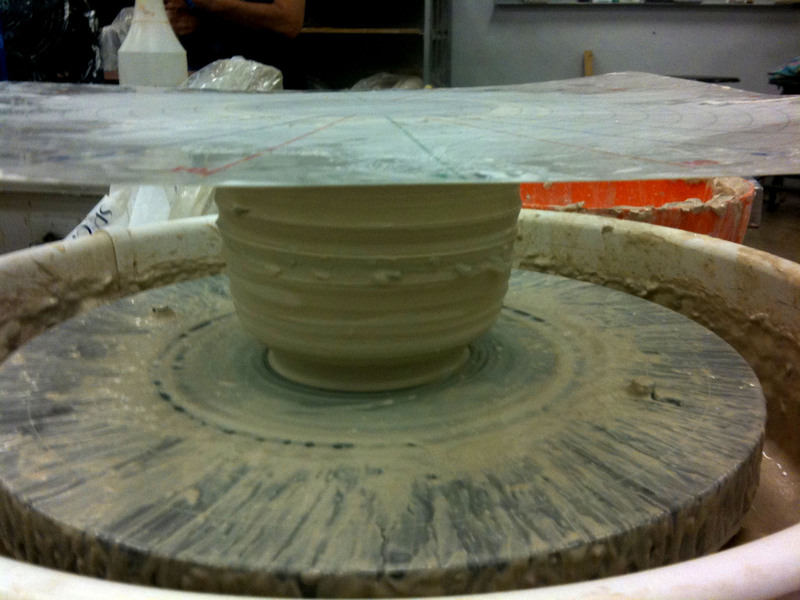 Throwing “off the hump” allows me to throw multiple lids from one piece of clay and save time. The large gallery to store the butter adds to the complication of making sure the lid fits snuggly, by adding a large bowl inside. 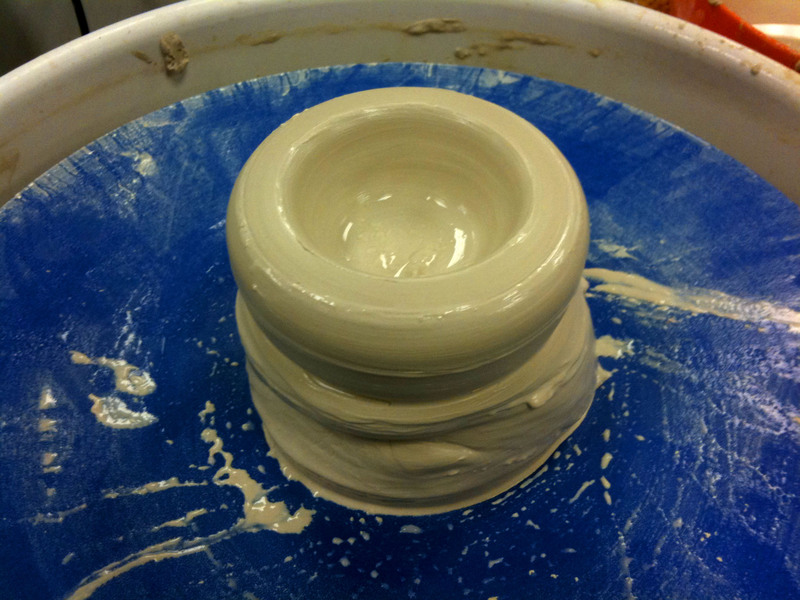 The first step in making the lid is to center just the top of the large lump of clay. 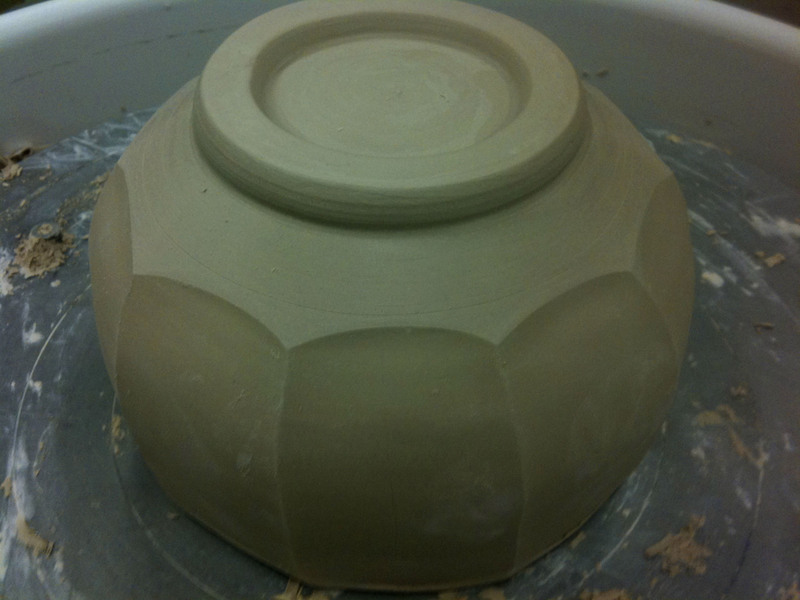 The part I center will be the lid. 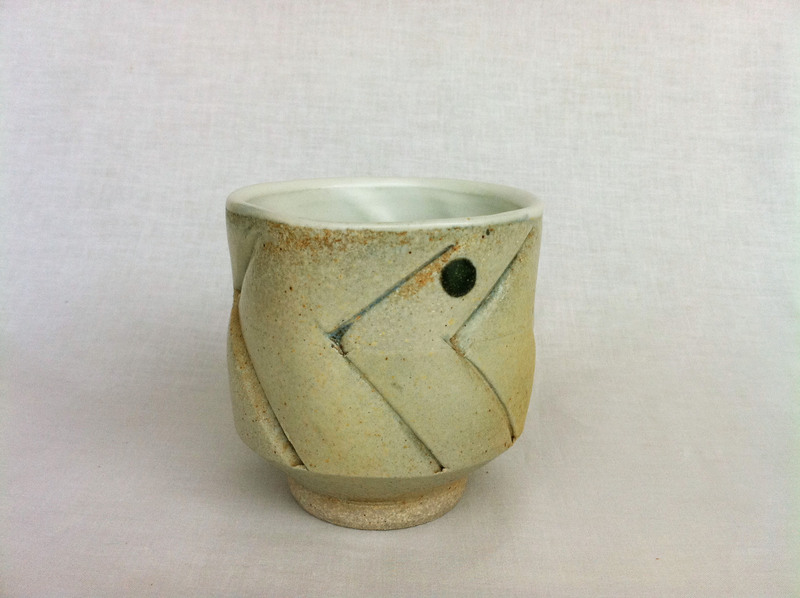 I open up the center of the clay just like regular bowls, but after opening up I push down along the outside with my finger to create the lip of the lid. Careful measuring is done with calipers to make sure the lip of the lid will actually fit the jar. 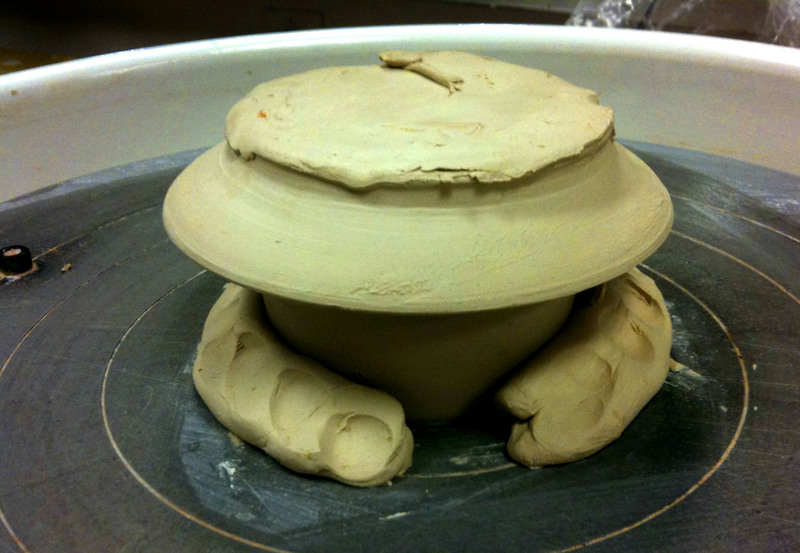 Then I pull the clay up to create the gallery for the butter, making sure that the gallery is not too big for the jar or will be touching any of the sides. 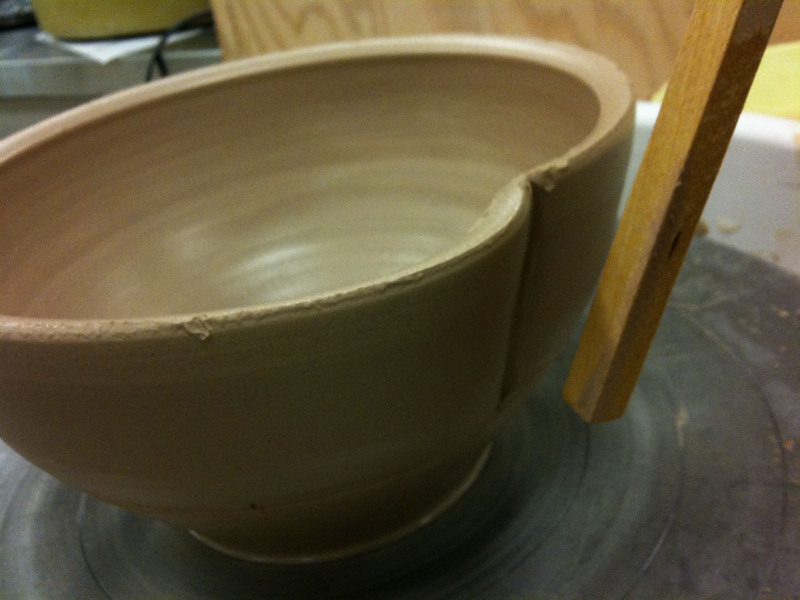 After the piece dries out a bit I trim the top and add a handle. 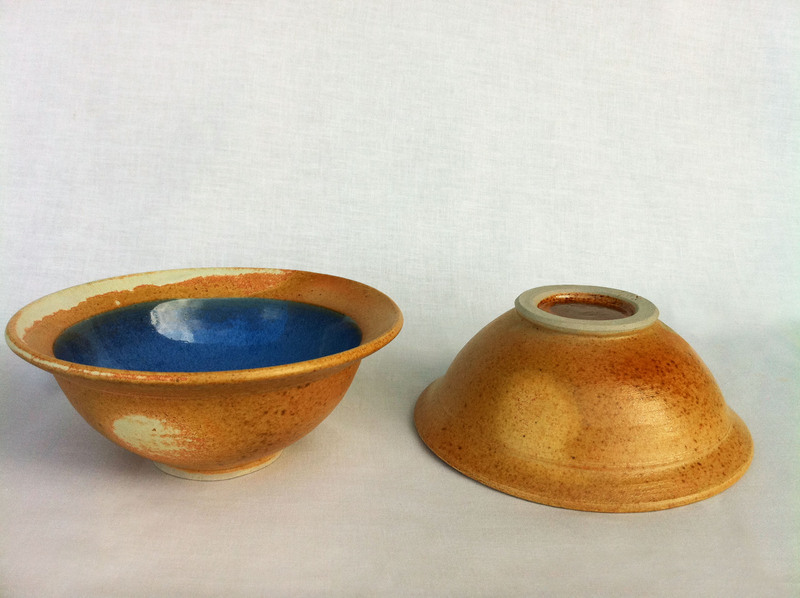 I began with 5 butter dishes after throwing and 2 have made it through the firing process. I have learned a lot along the way and have made more with a few adjustments. 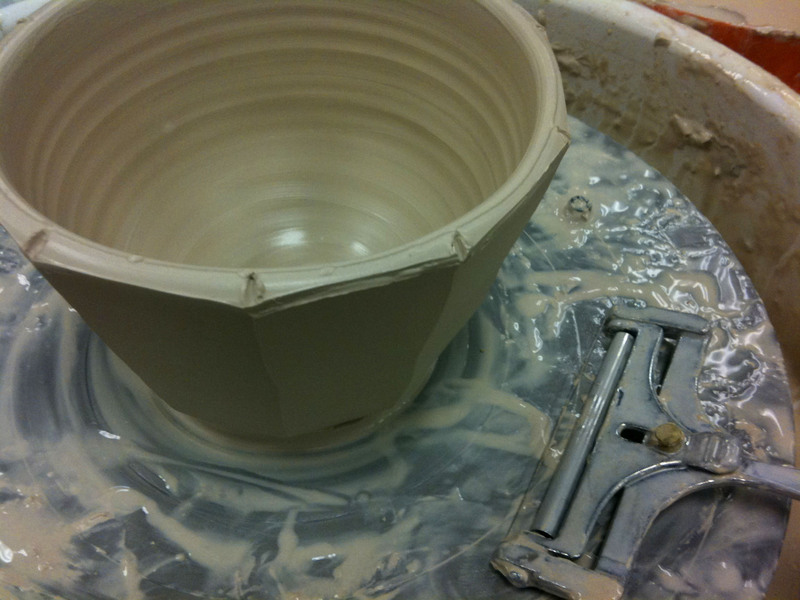 One major thing I found is that making a larger groove in the lid of the pot prevents the lid from sliding around so much. I decided I also like them better without a handle on the top. 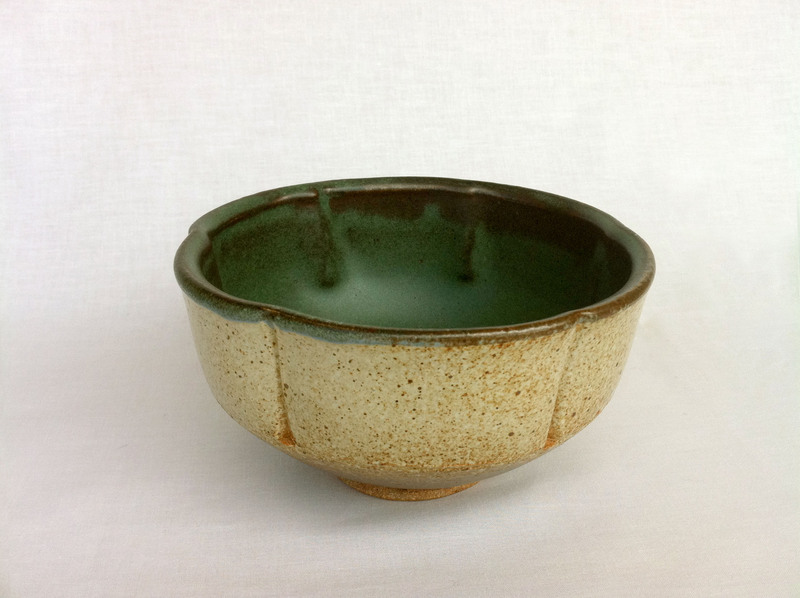 Since they are small a handle is not necessary and one can lift the lid from the sides with the larger lip around the edge, which is actually how most of the pictures online showed them. 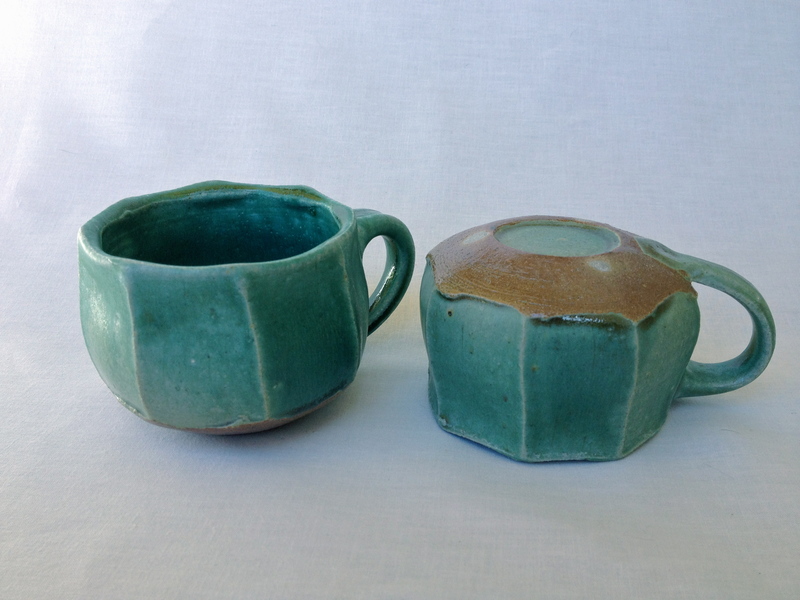 I have finished pictures of the first butter dishes with a wonderfully green glaze. 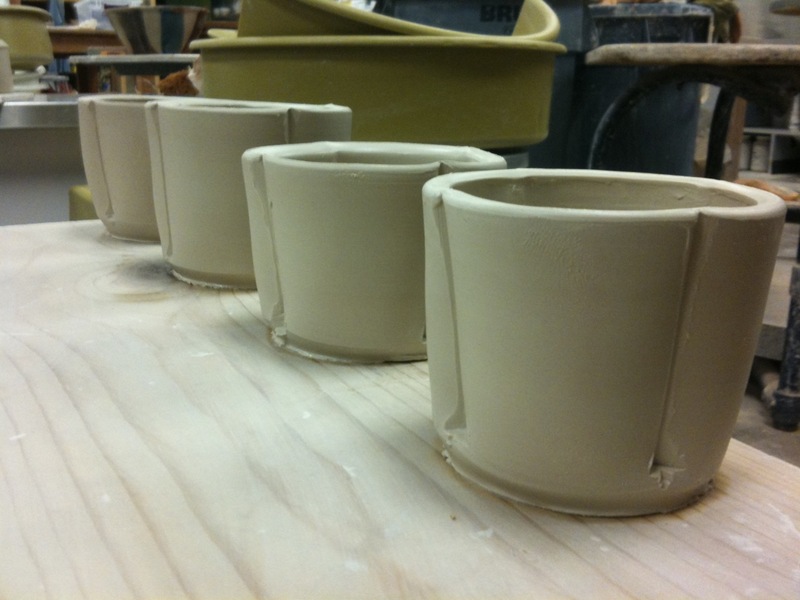 When the newest version with lids without handles is fired I will up load them! Thanks for reading and enjoy the pictures! 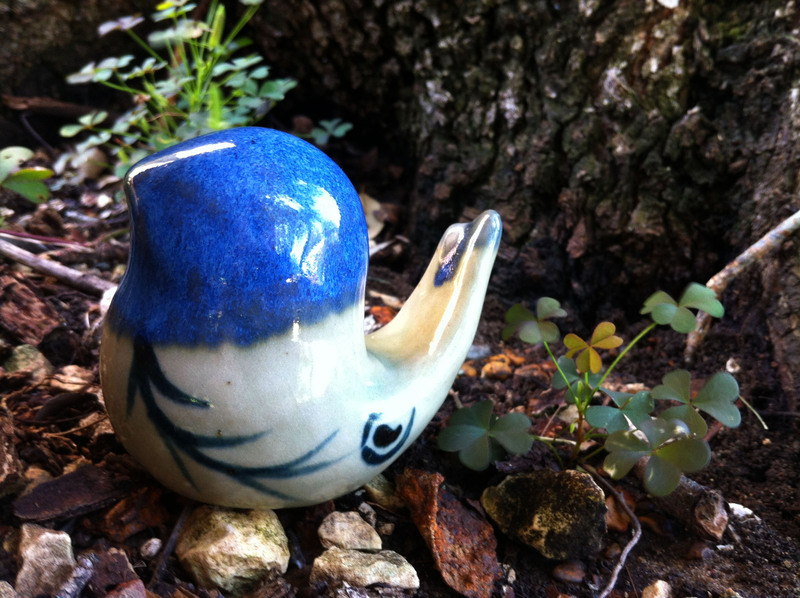 Birds, Birds, and More Birds – Pictures! 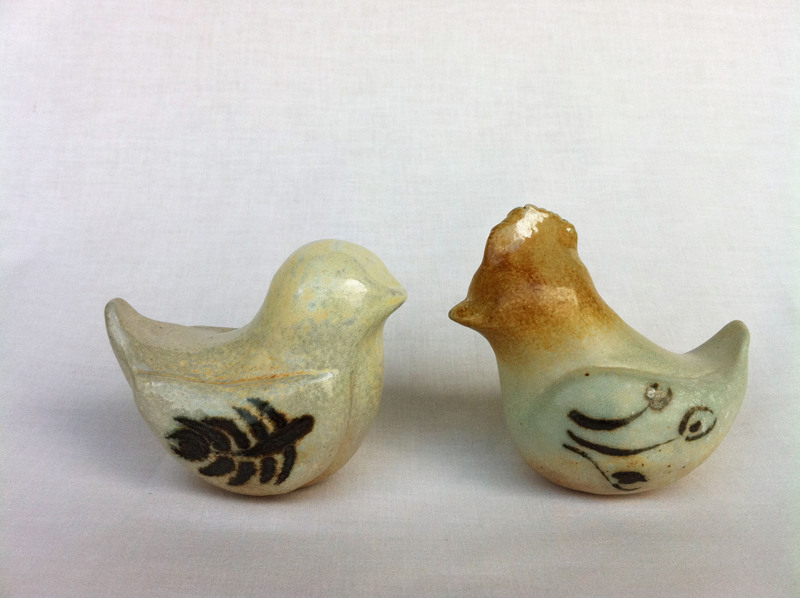 The last couple of months I have been busy making birds and putting them on my pots. 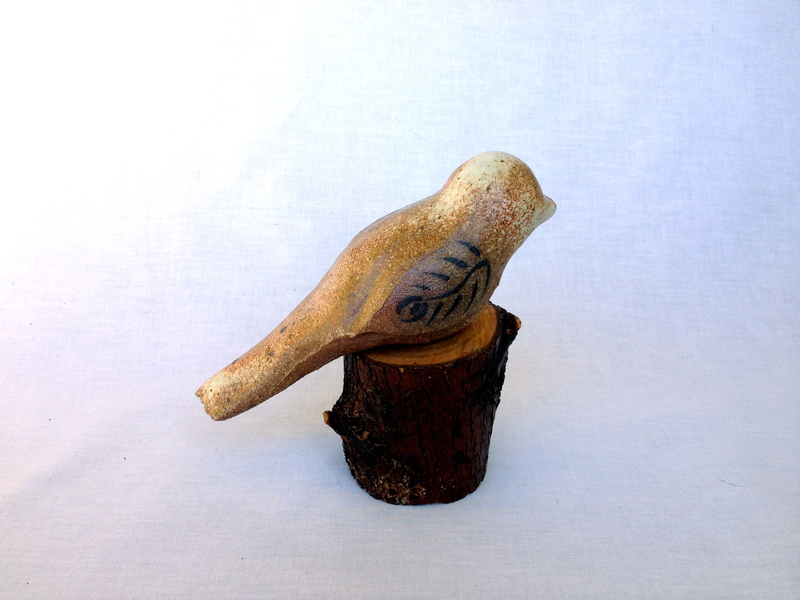 You can read in one of my first blog posts how to make the sitting birds. 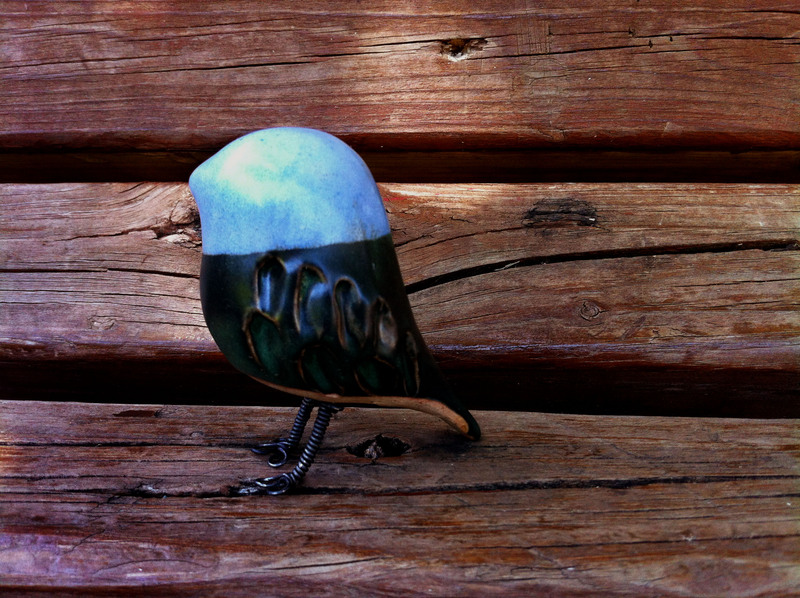 Since the birds are easy to make I have been working on them during my spare time at home, so I have quite a few. 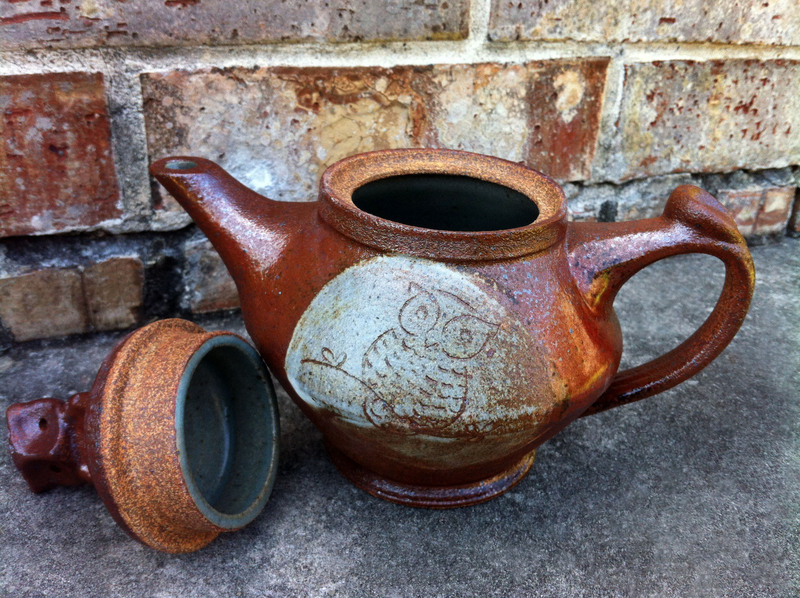 My loyal readers will also recognize my tea pot from a previous blog, but I have now added matching owl tea cups! Enjoy the new pictures! 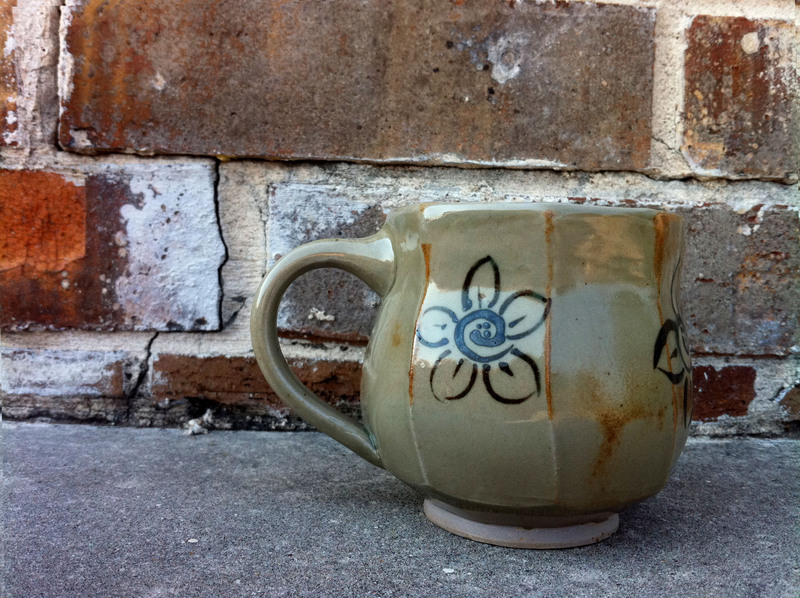 Artists are resourceful individuals using found objects to create textures or alter pieces. 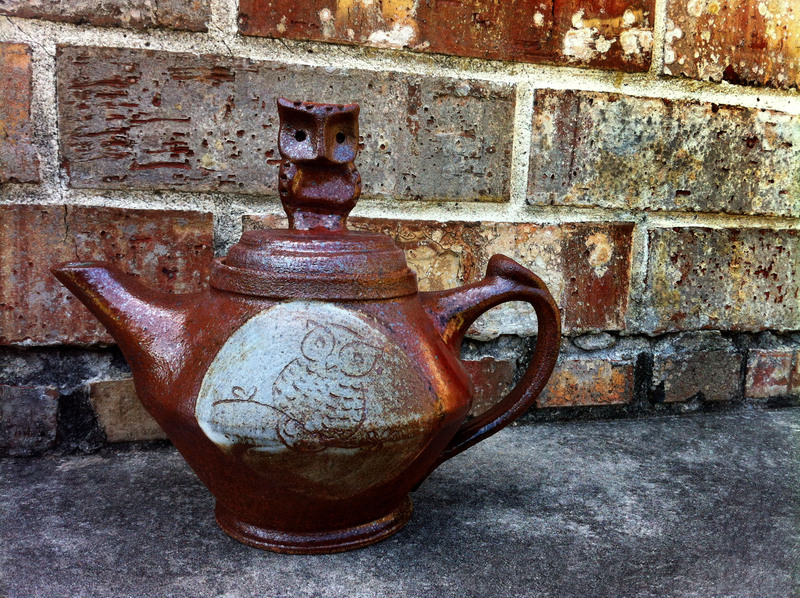 As I discovered in college as a poor student many scraps and random things can be used as tools. 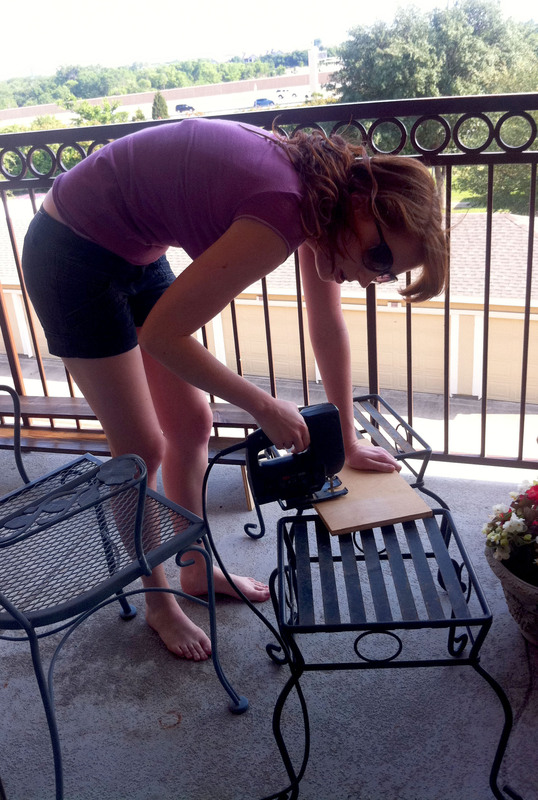 One of my favorite print making “blocks” was made from card board, glitter, yarn, and glue. All things I could find around the house. The Craft Guild where I work now is no different and one must be cautious not to throw away stuff lying around since the “junk” might be someone’s perfect altering tool. 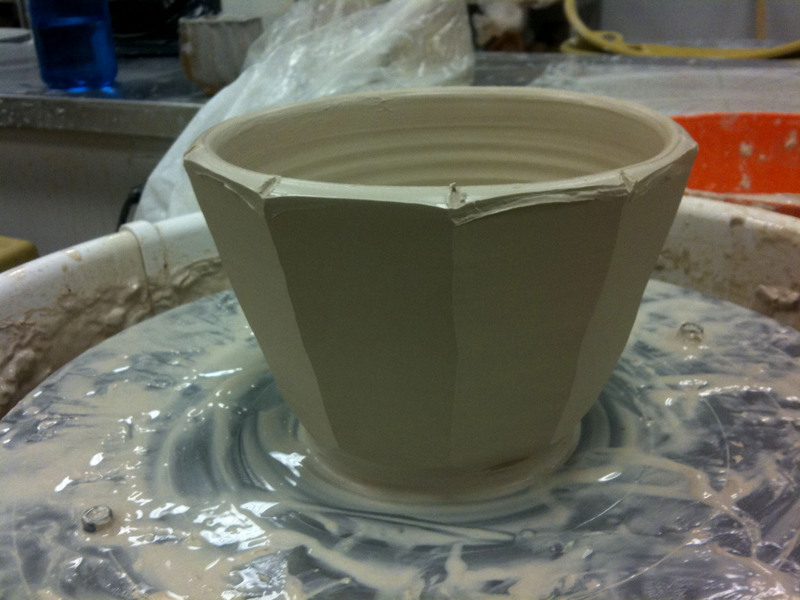 I would never have thought to use a cheese cutter to alter my pieces, but it is a common tool around the clay room. 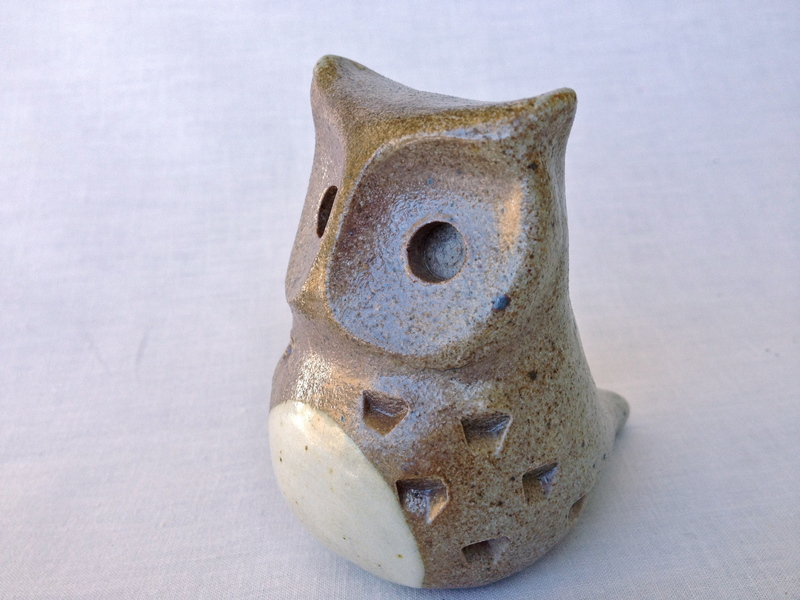 I have had some trouble not cutting through the entire wall of the piece, but thanks to some tips from other clay people I have made some fun things! 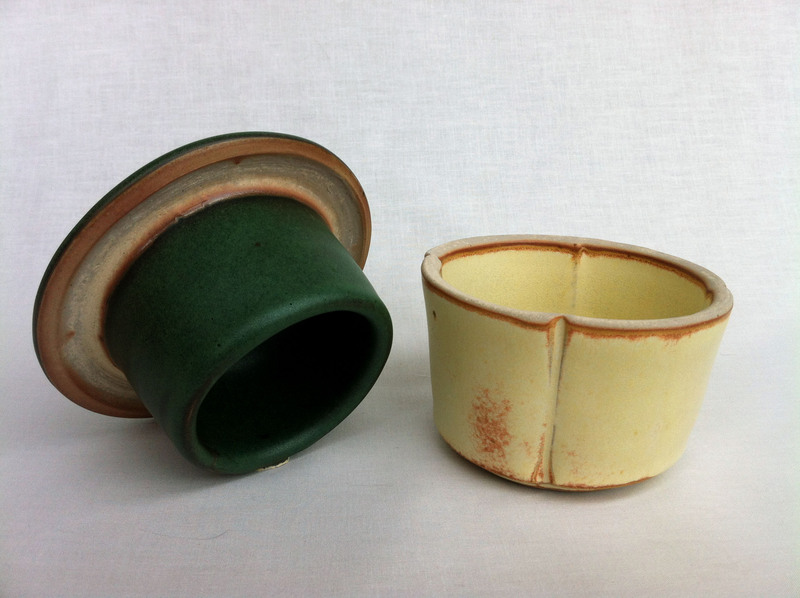 The cheese cutter allows one to take a round piece thrown on the wheel and create flat sides. It is difficult to use a cheese cutter when the piece is already been shaped. I have frequently cut holes in the wall where it curves out. 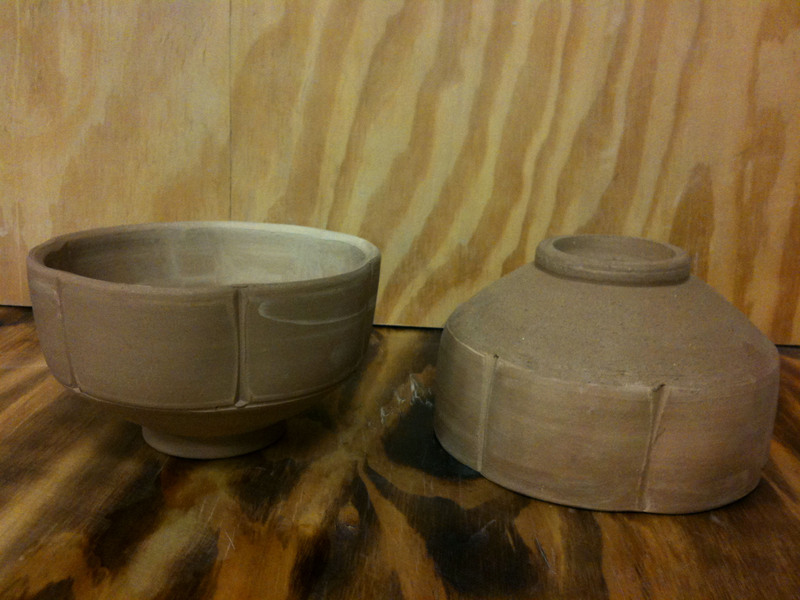 I have been much more successful not cutting wholes when I shape the pieces after I have cut the sides. 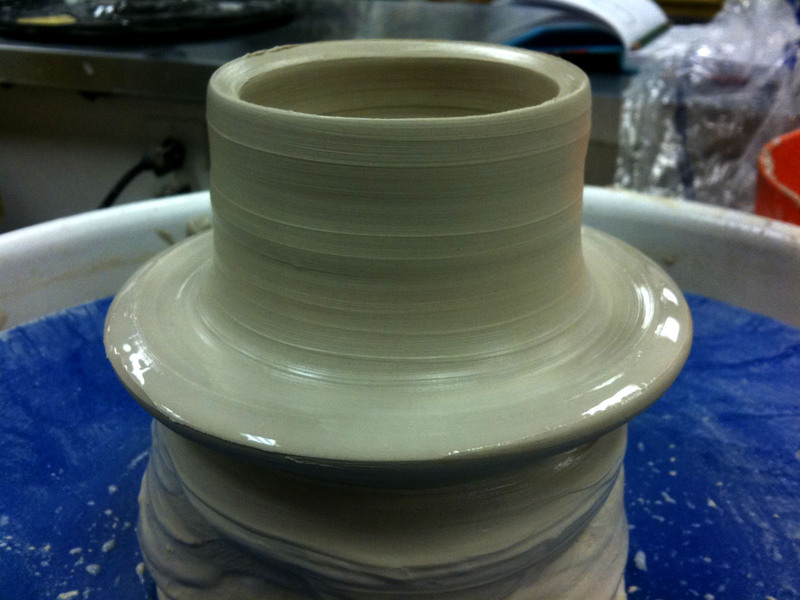 I center and throw a cylinder like normal, except for leaving the sides thicker than normal. When I have pulled up the walls as high as I want them I place even marks around the rim with my stencil so that my cuts will be evenly placed. 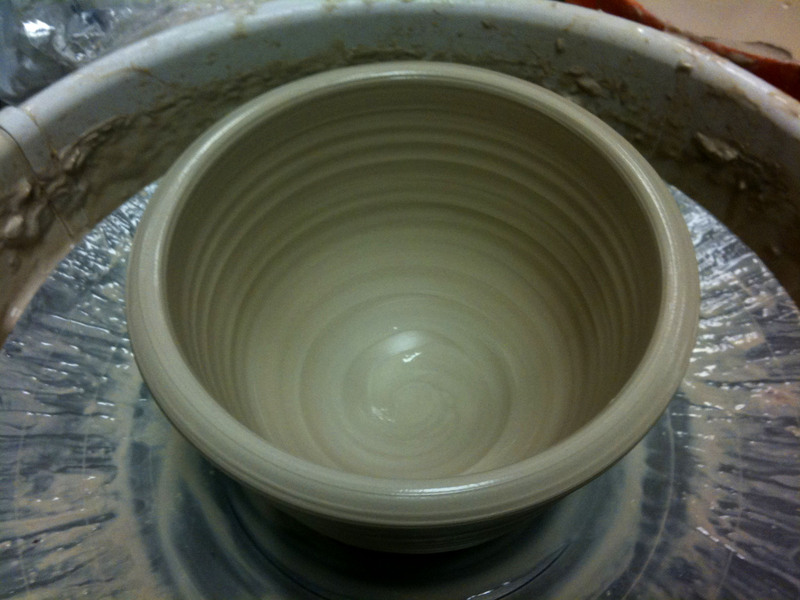 Then I line up the cheese cutter on the rim between the marks and pull straight down. The bar on the cheese cutter is handy to keep the wire the same distance throughout the cut. I have found that one cut is all you get. If I mess up a little and try to cut the same spot again the bit I cut gets stuck to the wall and little messy bits gunk up that side, but with a bit of practice one cut is all you need. 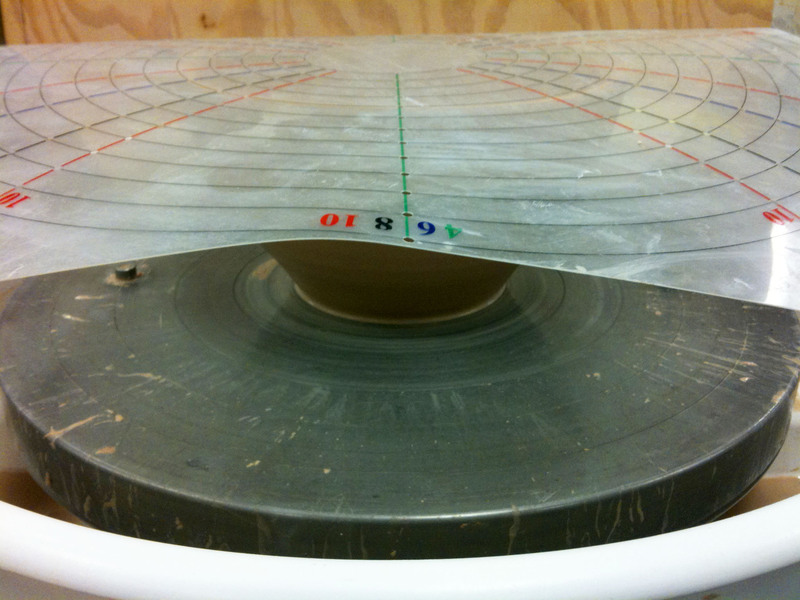 Once the sides are all cut it is time to shape the piece. 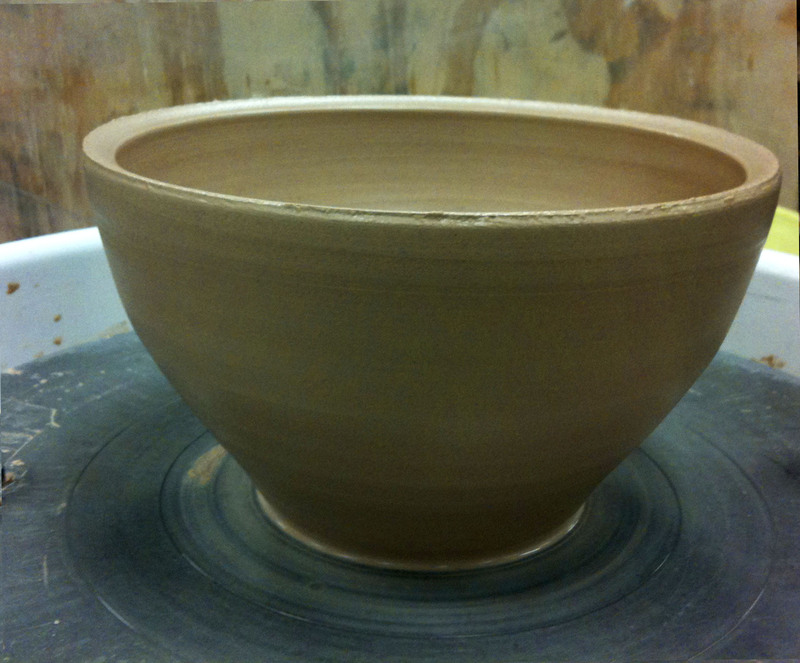 The current project is a bowl so I what a gentle curve out and then up. 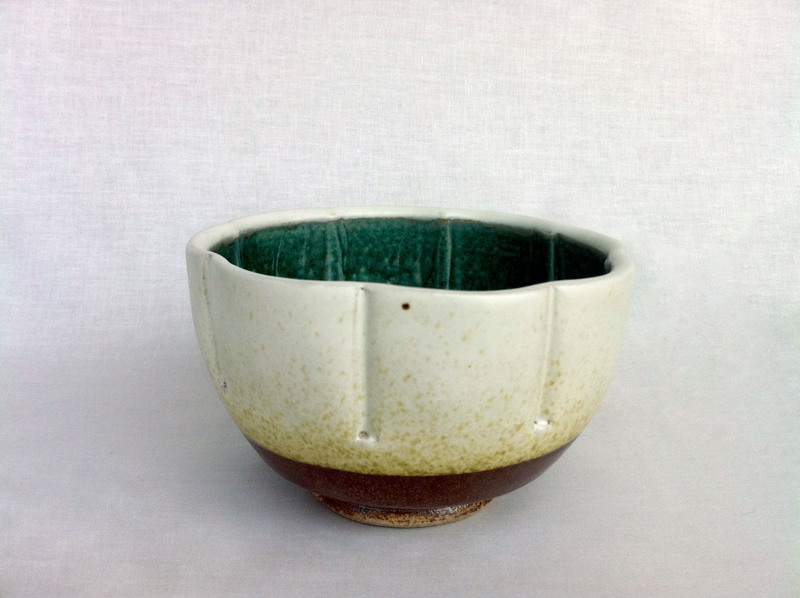 I push out from the inside of the bowl and do my best not to touch the outside because I will lose the edges of the walls. I use my sponge to push out first, but then switch to my rounded, red, rubber rib. It has a perfect curve to shape the walls. 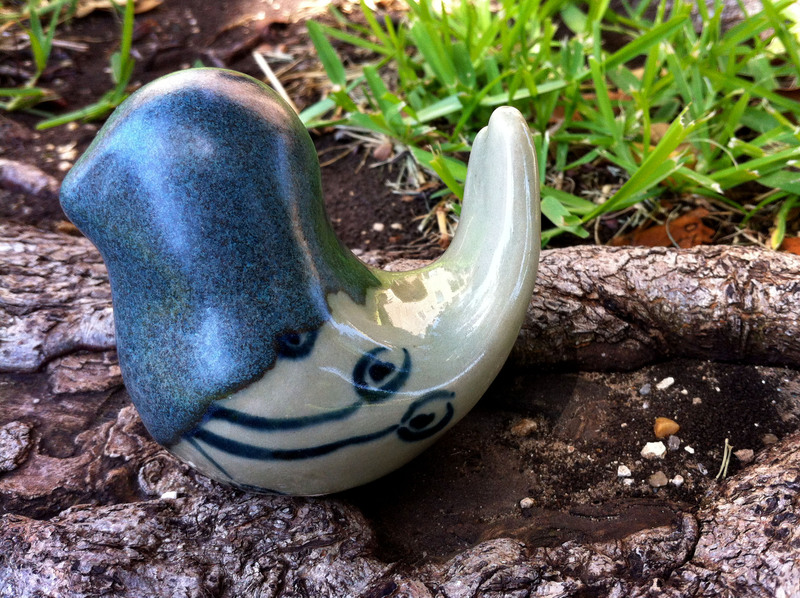 If the clay is stiff or stubborn I will also use my rounded wooden rib. One of the neat features created by the cheese cutter are the bumps along the top of the rim, but in order for the piece to be functional I have to clean it up a little bit. 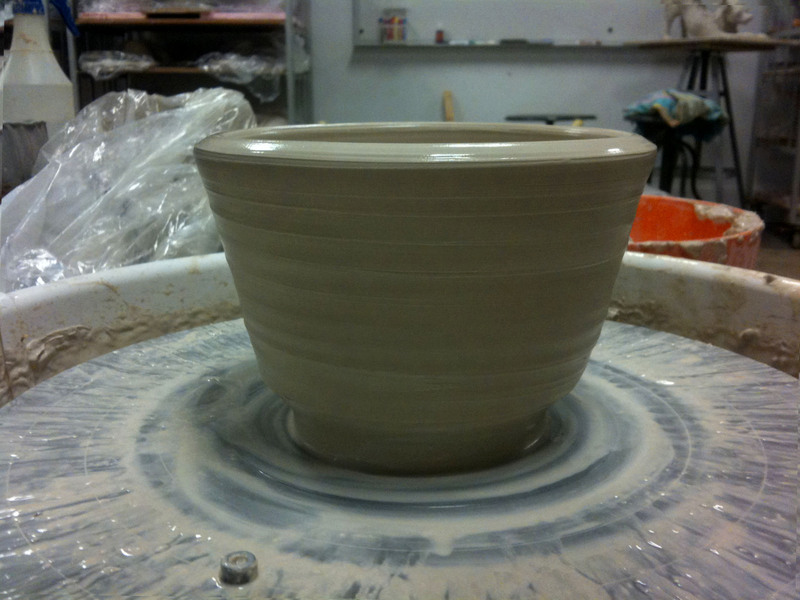 Lightly pressing with my fingers I create a slight slant along the rim of the bowl but keep the little bumps. My other favorite part of using a cheese cutter is the great wave pattern created by trimming a foot. 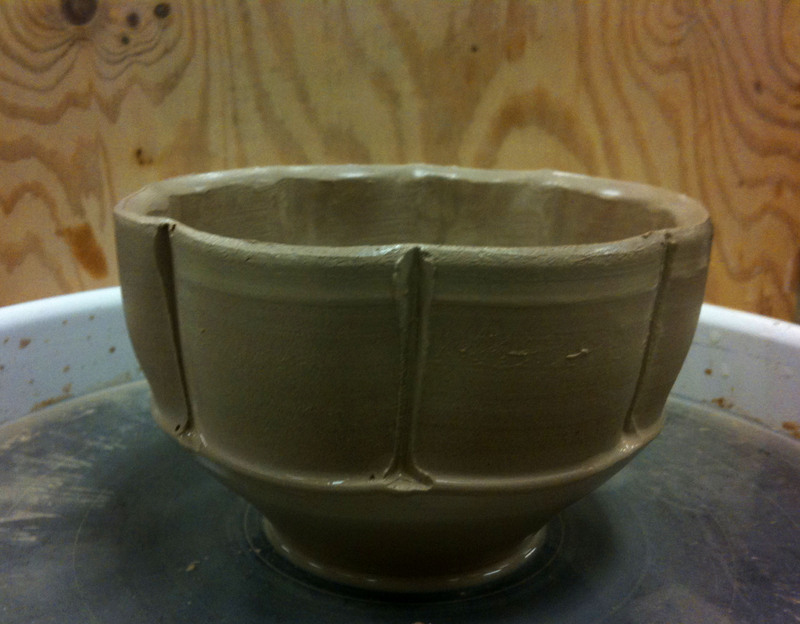 I make sure to leave enough clay at the bottom so I can trim an angle at the belly and a nice size foot. 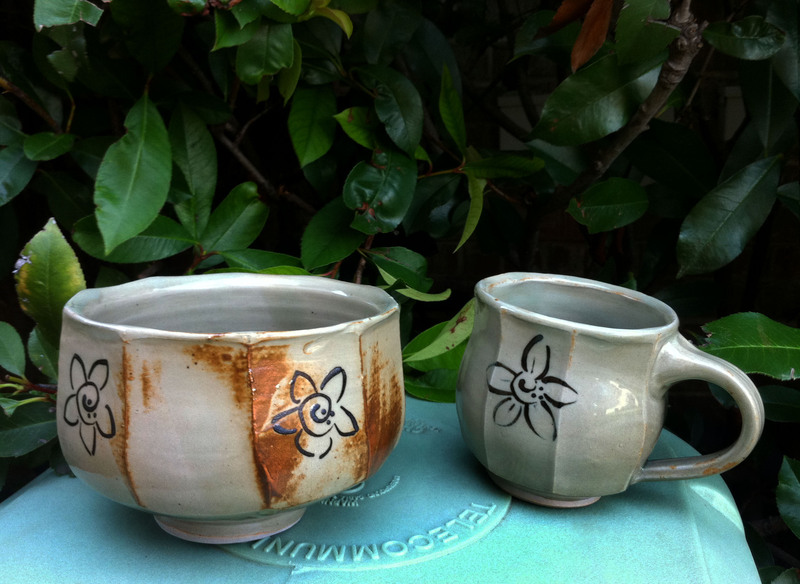 I also made some cups with a cheese cutter to match the bowls and then had lots of fun painting flowers on them. 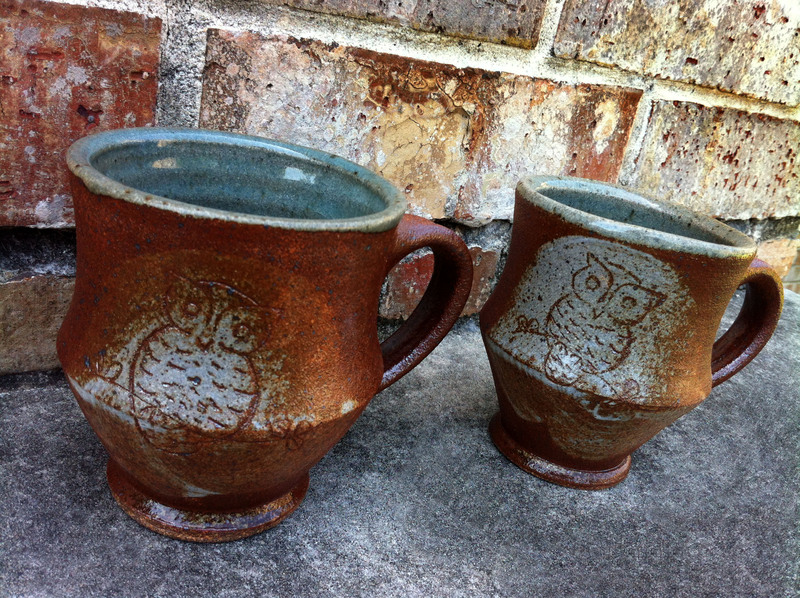 The cups and bowls are already out of the kiln and I have some fun finished pictures below! Enjoy! 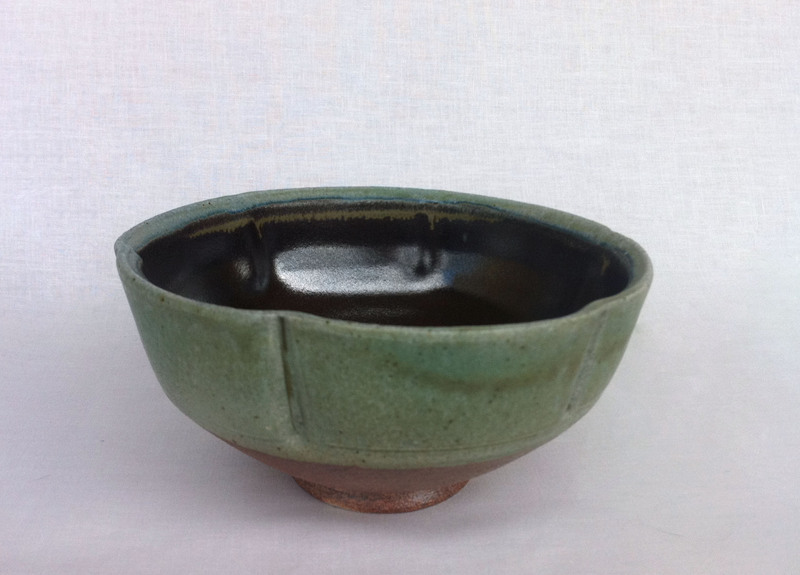 Some of my new favorite pieces to make are altered bowls. 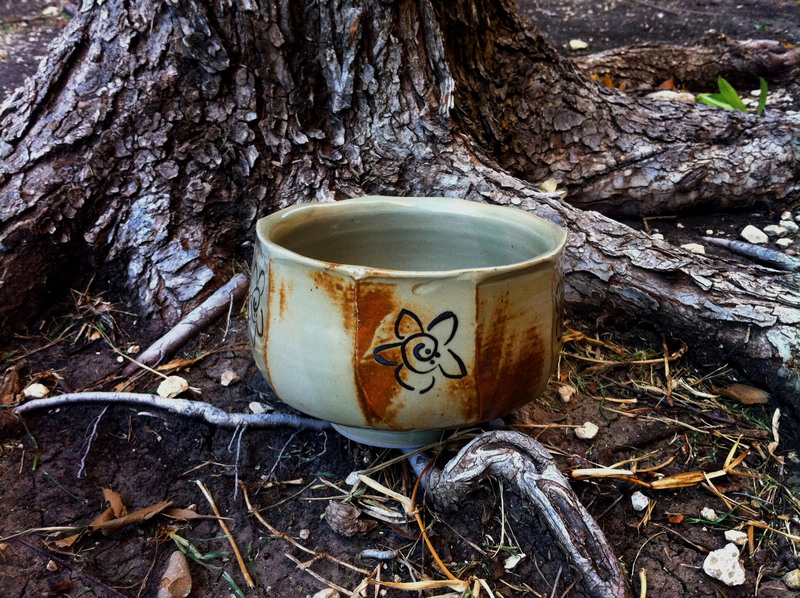 In the Craft Guild workshop post I mentioned using squared dowel rods to alter pieces and in this post I am going to show you how I created the ruffles on my bowls. I think I enjoy altering pieces with the dowel rods so much because I love ruffles! My twin sister has teased me on occasion for picking out new clothes at the store that all have ruffles. 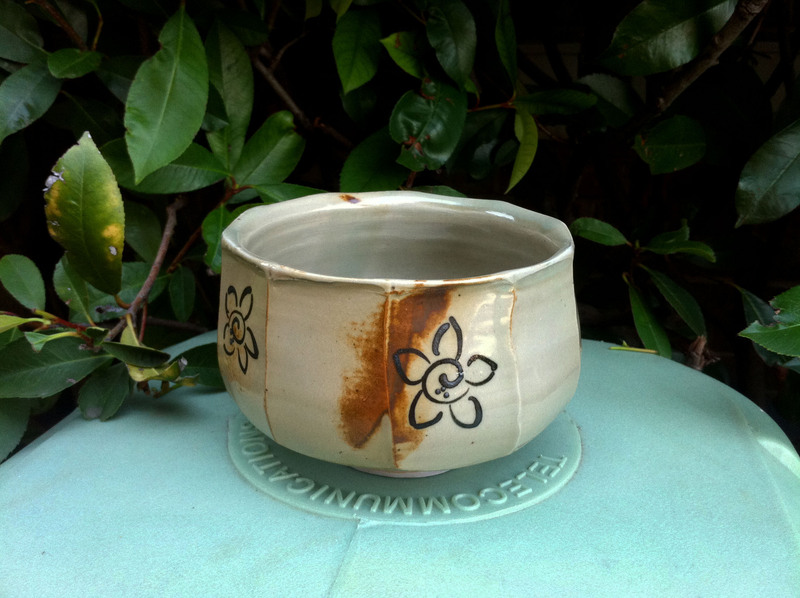 This altering technique is easy to do and begins with a simple bowl shape. 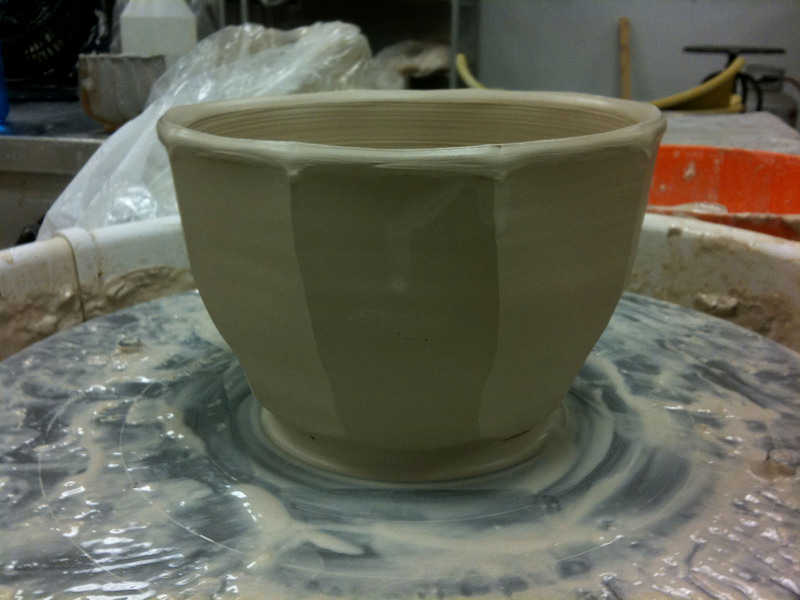 Altering should be done at the very end of throwing so that the design is not lost by adjusting the shape. 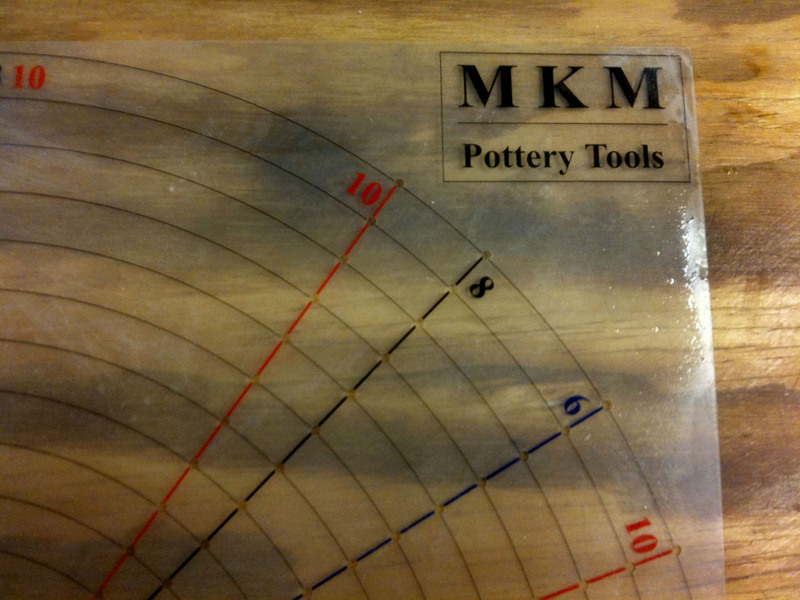 The MKM grid tool in the picture below allows quick and easy placement of lines. I love that this tool takes away the painstaking effort of measuring so that I can quickly and evenly place the ruffles around the bowl. 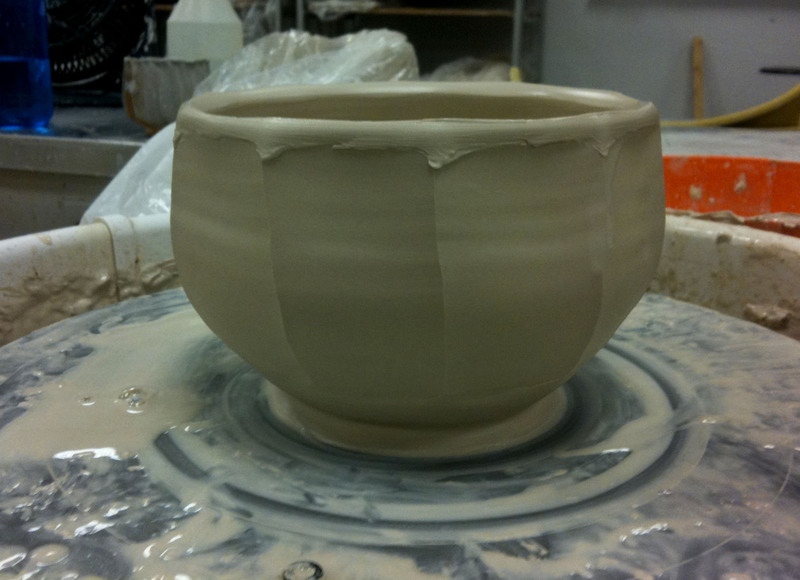 After I have placed little marks around the rim of the bowl I start creating the ruffles. The ridge is created by lining up the dowel rod on the outside of the piece and on the inside placing your fingers on either side. 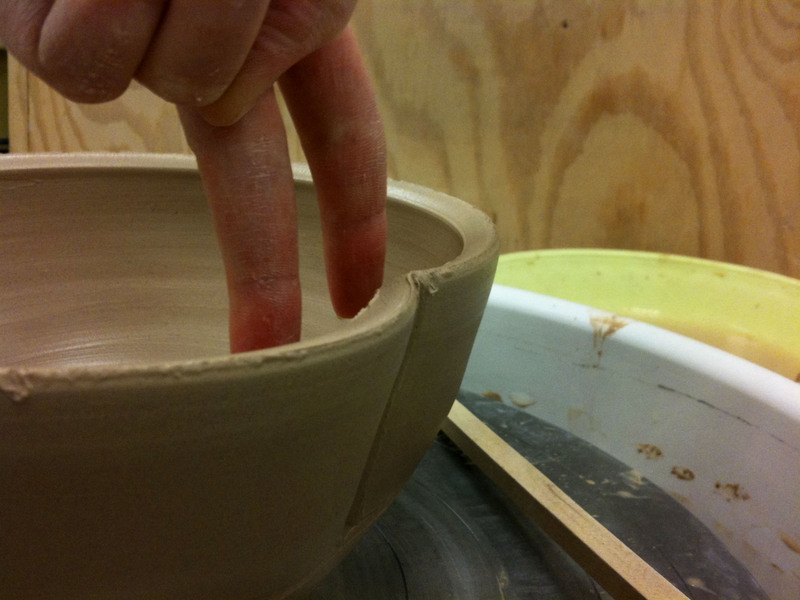 The curve created will depend how much pressure is placed outward as you press with your fingers. 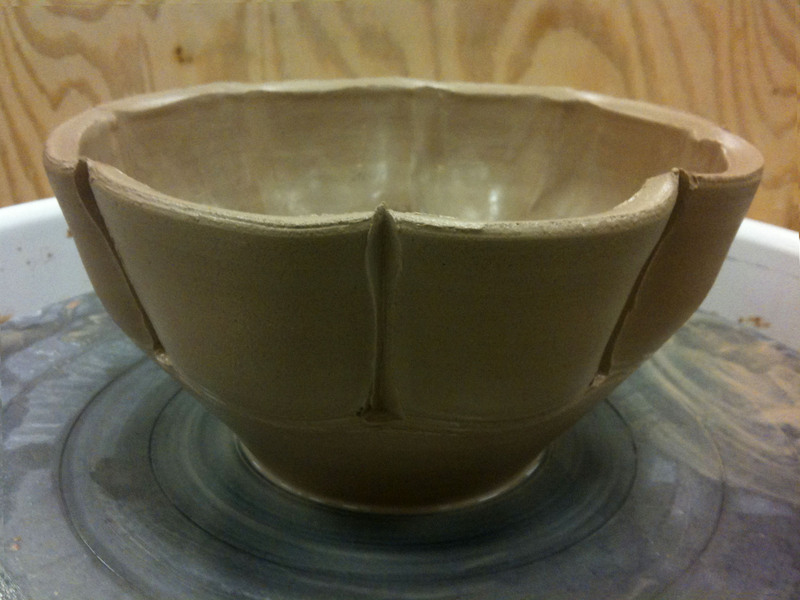 I make sure to put pressure along the rim of the piece in order to get the ruffled look around the top. Then continue the ruffles all the way around the bowl. 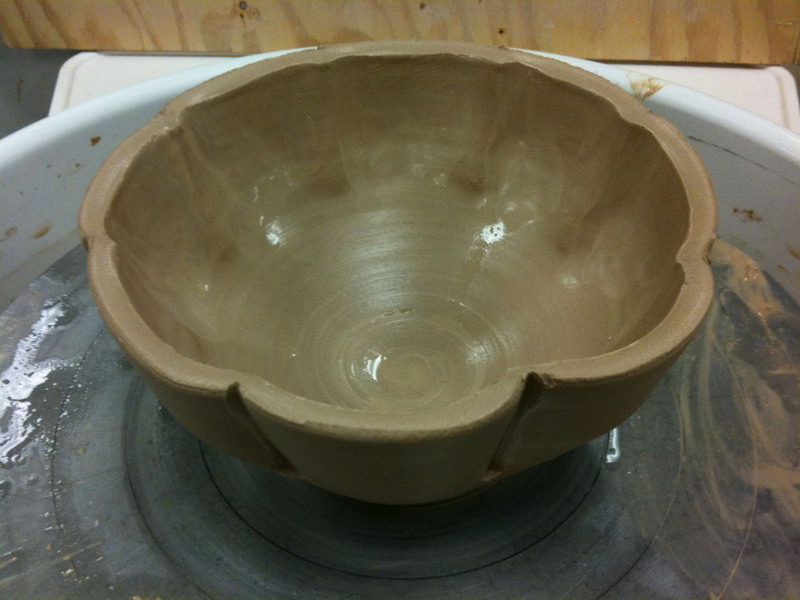 Depending on how many ruffles and how low they are placed look of the bowl will change. 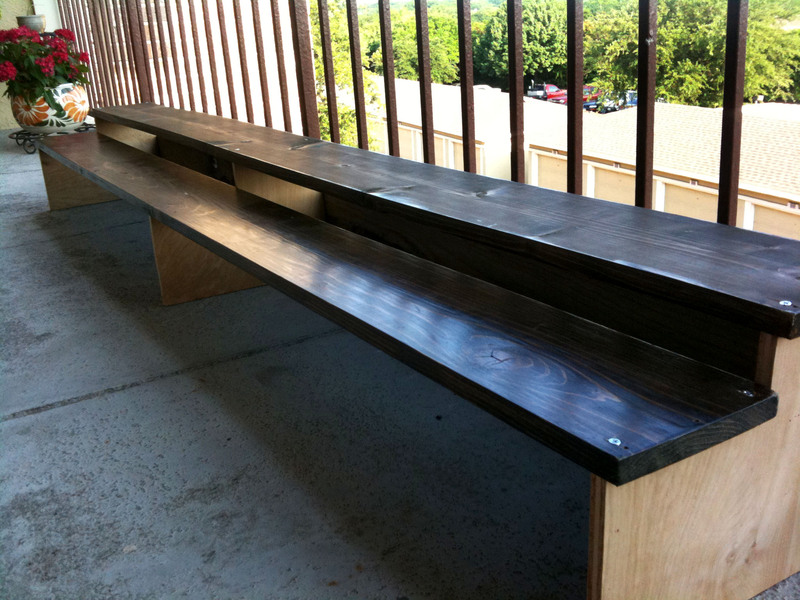 Here are a couple of pictures of finished pieces. 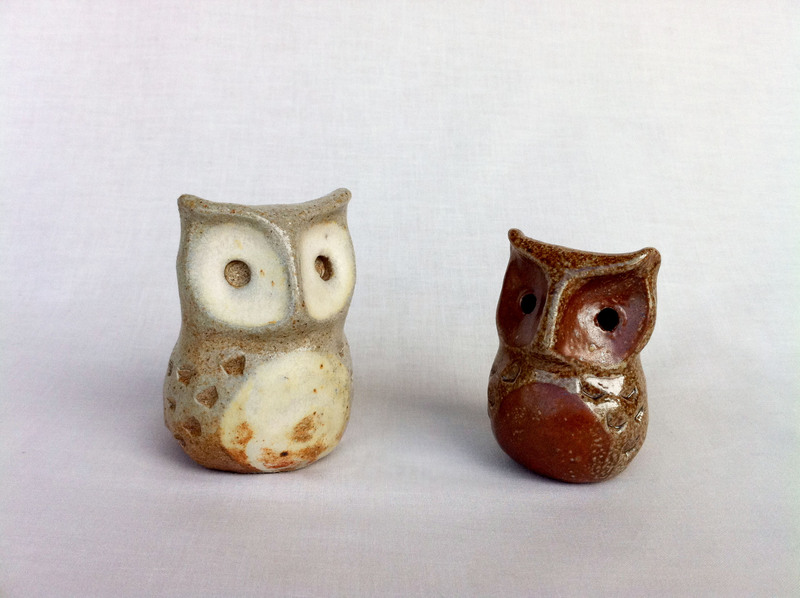 The first one was fired in the salt kiln and the second fired in the regular gas kiln. 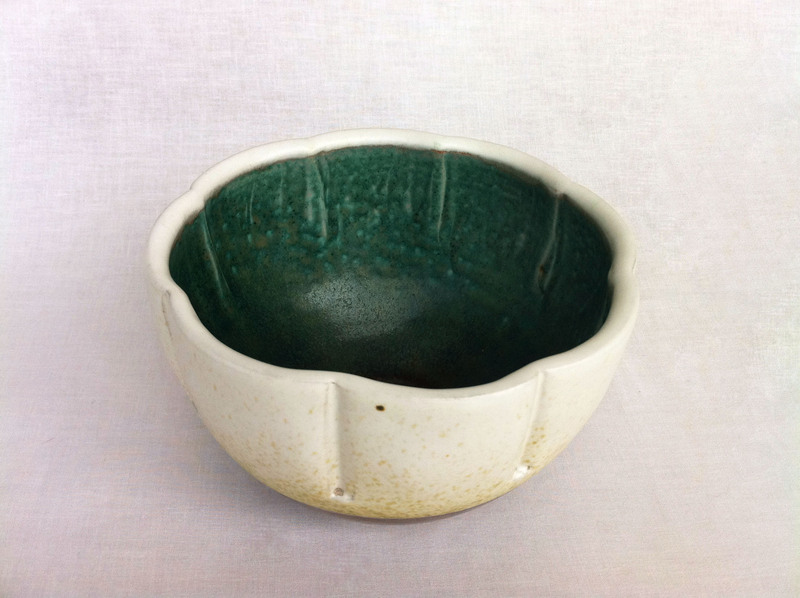 An interesting fact to point out is that the green glaze on outside is the same as the green on the inside of the second. 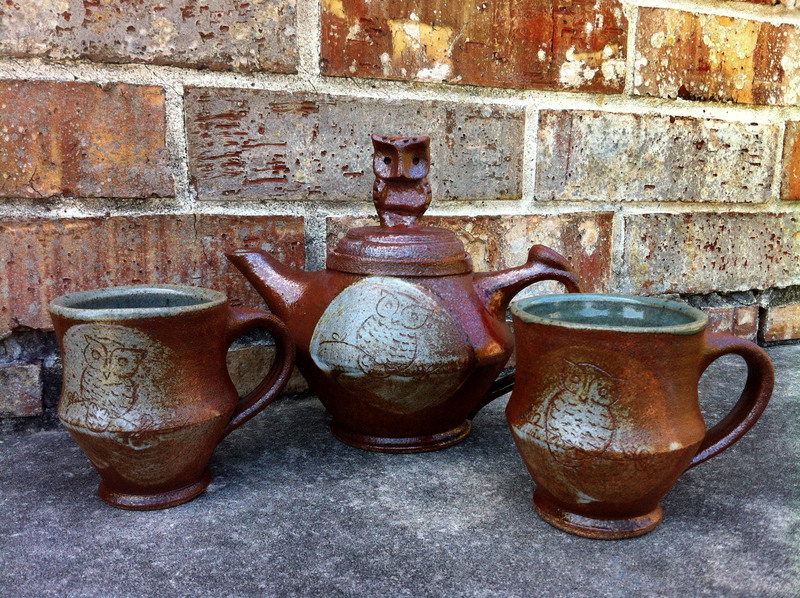 This is due to the fact that they are different types of clay and were fired in different kilns. Thanks for reading! 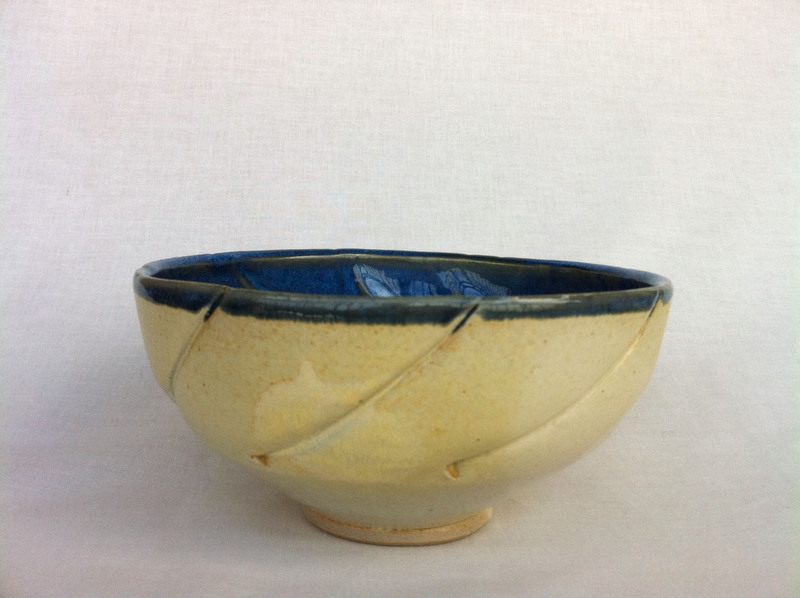 Next week I will show how to use a cheese cutter to alter bowls or cups! 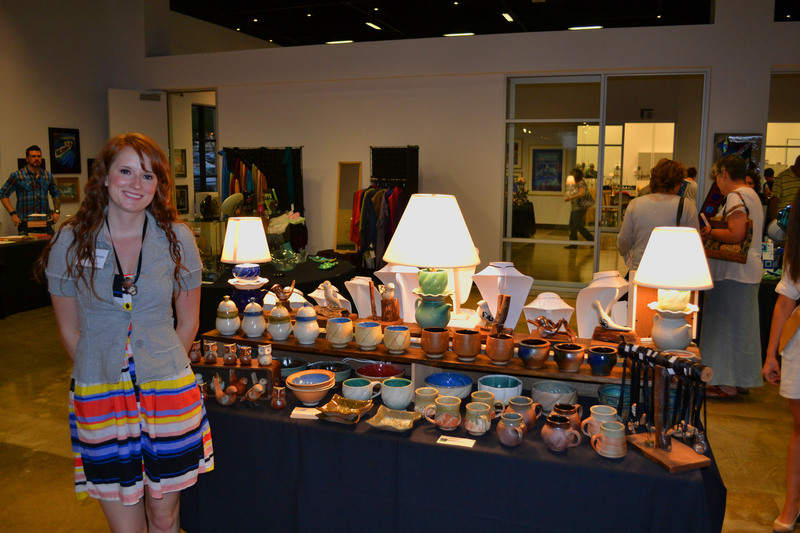 May 4, 5, and 6th was the Craft Guild’s first spring show and sale. 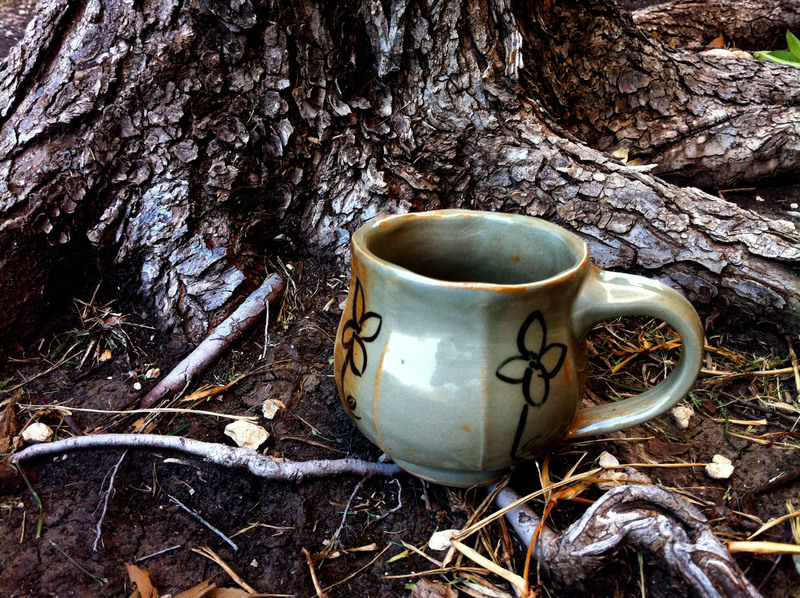 Even though I have not been blogging very much over the last few months I have been creating a lot of work. In my new work I altered pieces to make ruffles and geometric shapes inspired by Jeffery Oestreich’s workshop in January. 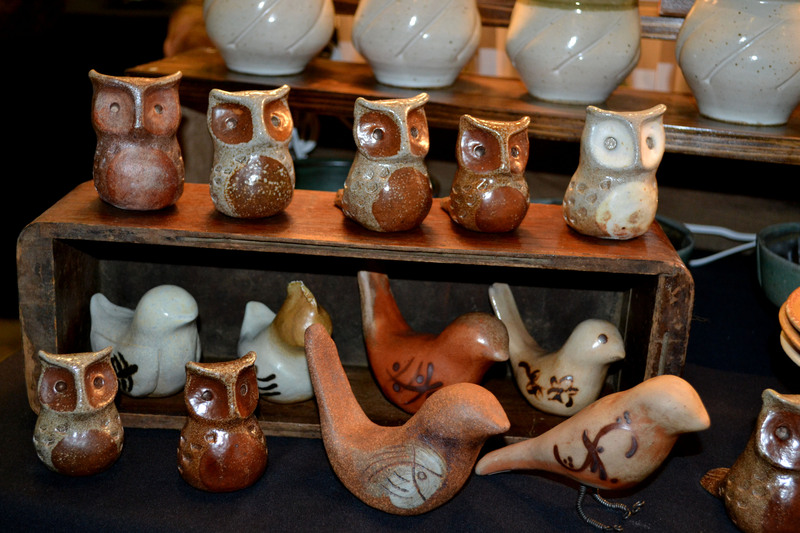 In order to show off my new stuff I used some power tools and created much sturdier shelves than the show in November. 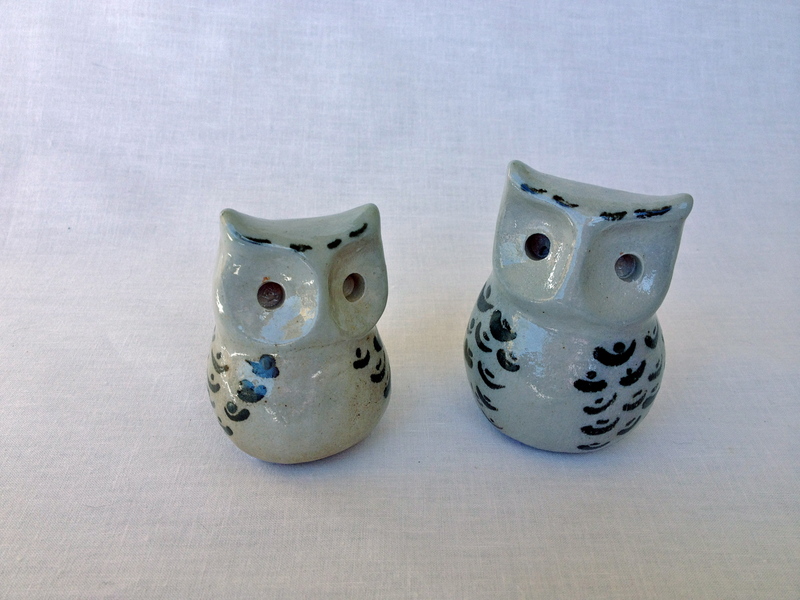 The week of the show the Craft Guild buzzed with nervousness and excitement since we were not quite sure how the first spring sale would go. Unfortunately our show was the same weekend as the well established Cottonwood show, but our staff worked hard to advertize and even got a great banner over busy Beltline to advertize. I got a great spot at the front of the Gallery to set up my table! 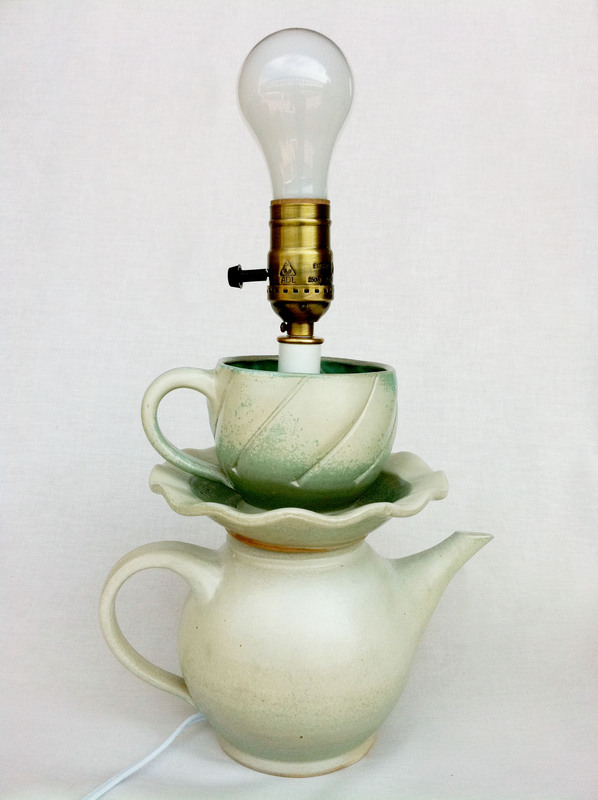 This year I brought extension cords so I could turn on my tea cup lamps. The new shelves lit up by the lamps looked great. My dad brought his nice camera and got some great pictures of my table. 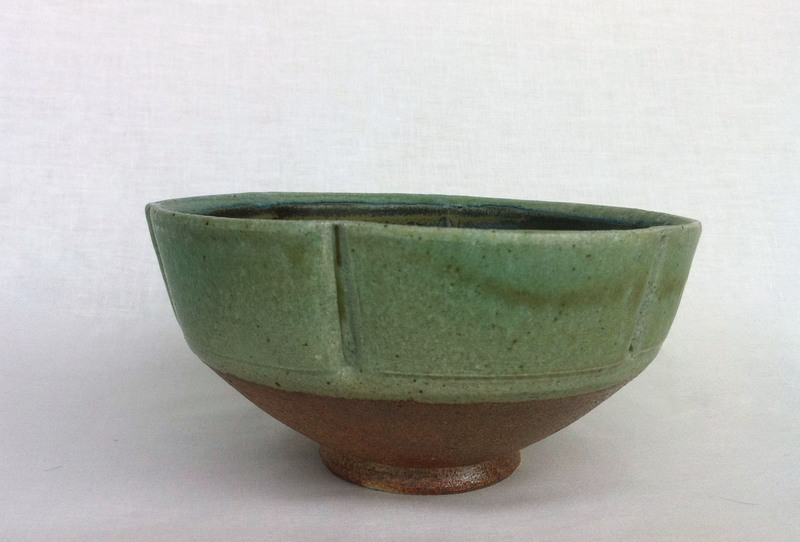 Friday evening was the opening for the show with great snacks, drinks, and an auction. I had a lot of support from the many friends and family that stopped by. Overall the weekend went very well and we had a pretty good crowd come through. 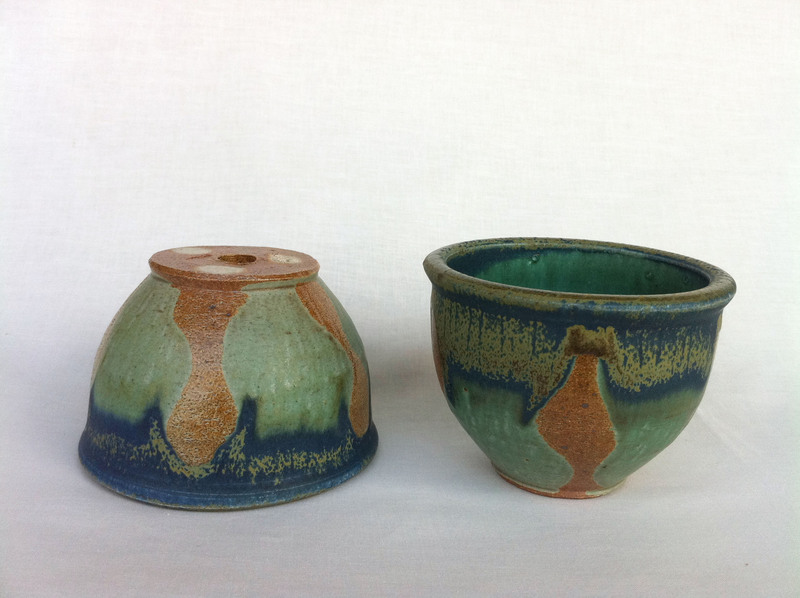 At the end of the show the Craft Guild staff liked my new work so much that they asked me to leave some things behind for the permanent shop! I was very excited and honored that they thought my work looked professional enough for the permanent shop in the gallery. 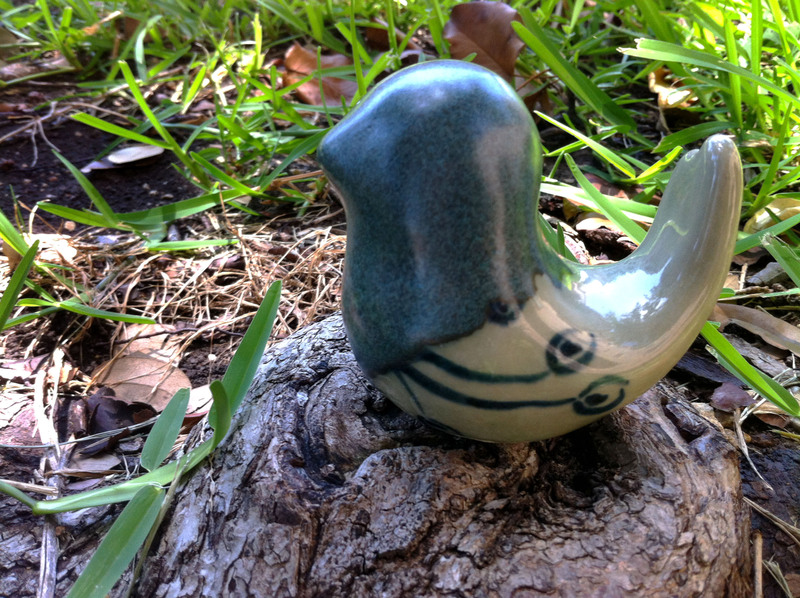 Below are some picture of my new pieces! It is hard to believe that it is already May and my last post was in December. A big part of my lack of blogging was due to the fact that I finally got my first “big girl” job out of graduate school. I have been getting to do exactly what I spent all those years in school preparing to do. 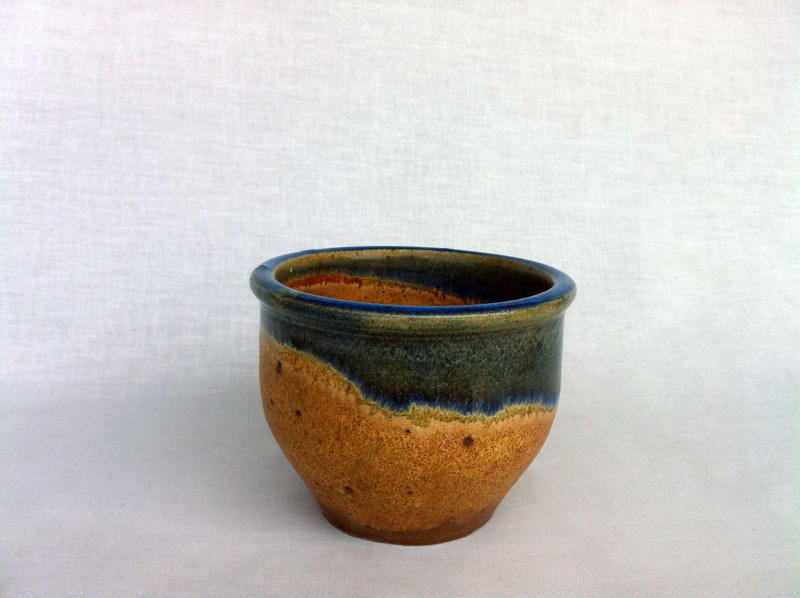 Even though I have not been blogging I have continued to make time to continue my development as a potter and I must say that I have really improved. 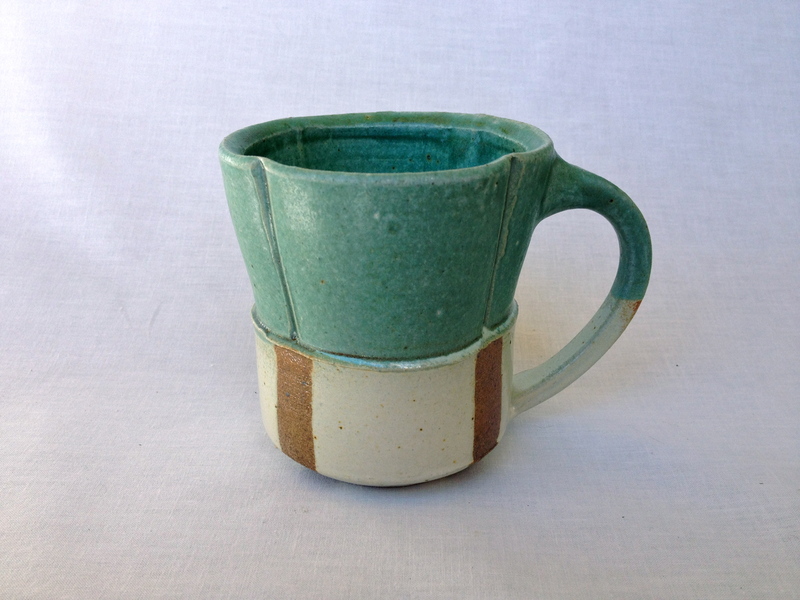 This improvement must be credited to Jeffery Oestreich who came to the Craft Guild of Dallas for a workshop in January. 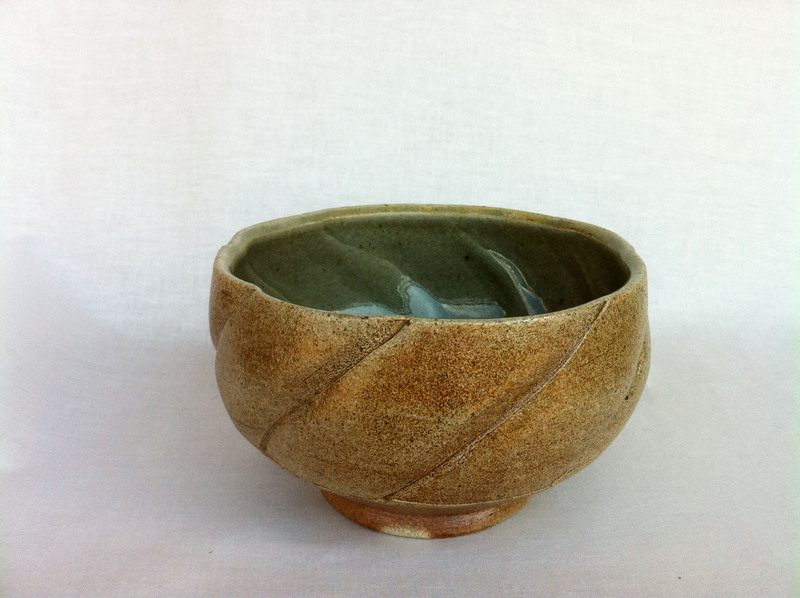 Not only is Jeffery an engaging and charming person, but a masterful potter whose every movement of the clay was purposefully and thoughtfully done. I have been inspired by his careful attention to detail and beloved passion of solving problems he encounters while creating his work. 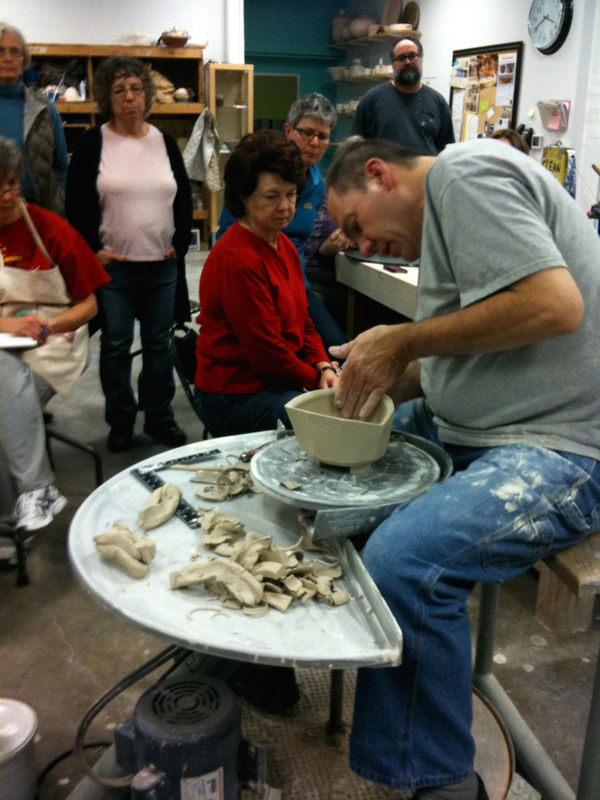 For the first day of the workshop we were lucky enough to have Jeffery teach us some of his glazing secrets! 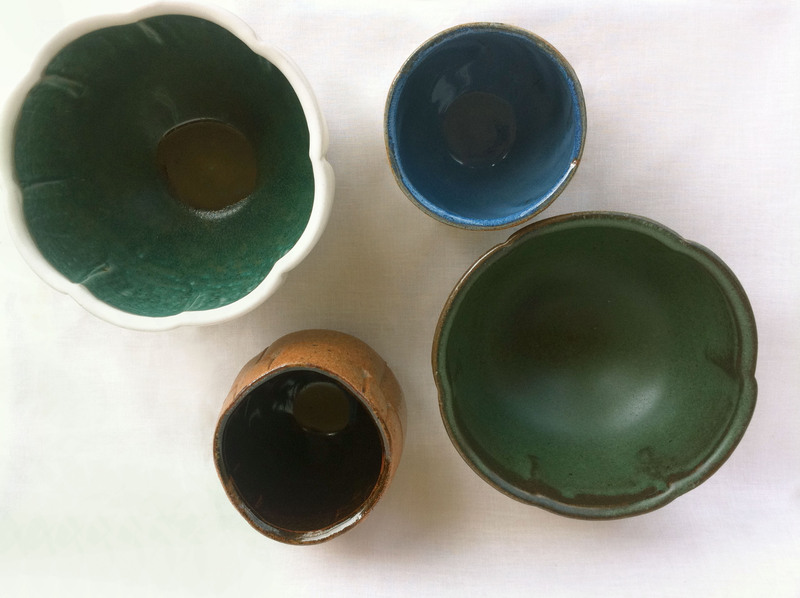 We were able to do a soda firing during the workshop which you can see in the pictures above. Most of his secrets we promised to keep secrets, but I can say that many center on his love of solving problems. 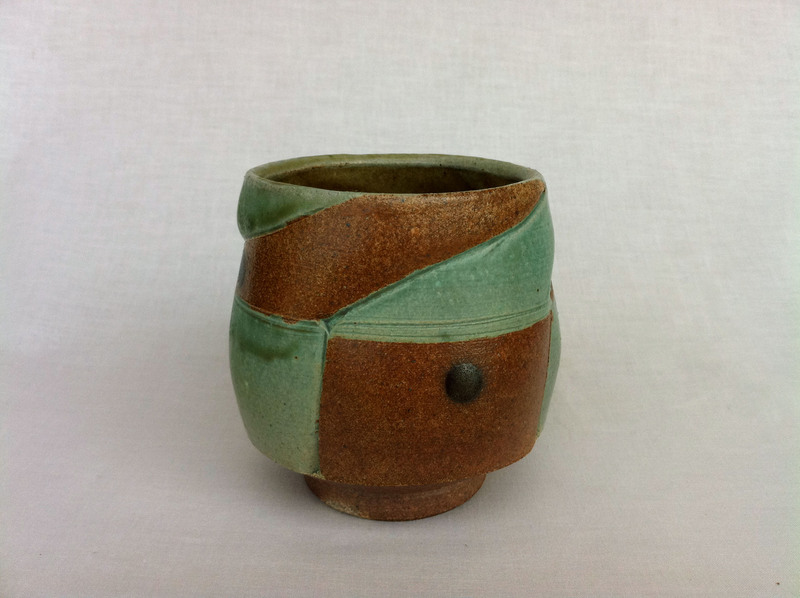 A tip I can share is about Jeffery’s lovely, clean geometric lines. He wondered how he would make the lines consistent and quickly. After some brain storming he created many stencils from different plastic sheets and used them to map out the designs on his work. A problem that Jeffery mentioned a few times was motivating himself to finish tasks that he did not enjoy. 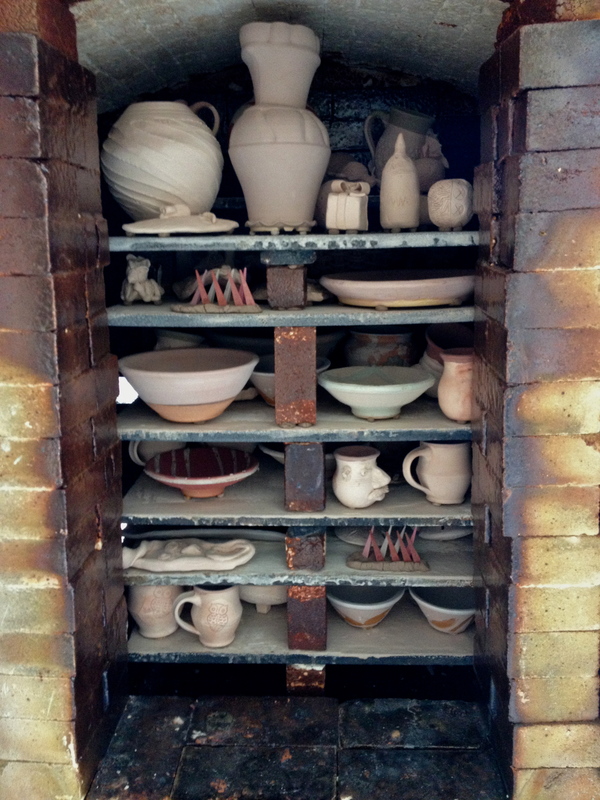 My favorite solution that he mentioned was that he did not like firing or making glaze tests so he built and decorated a crazy kiln to fire the tests. He knew if he made the task enjoyable somehow that he would be more likely to finish. 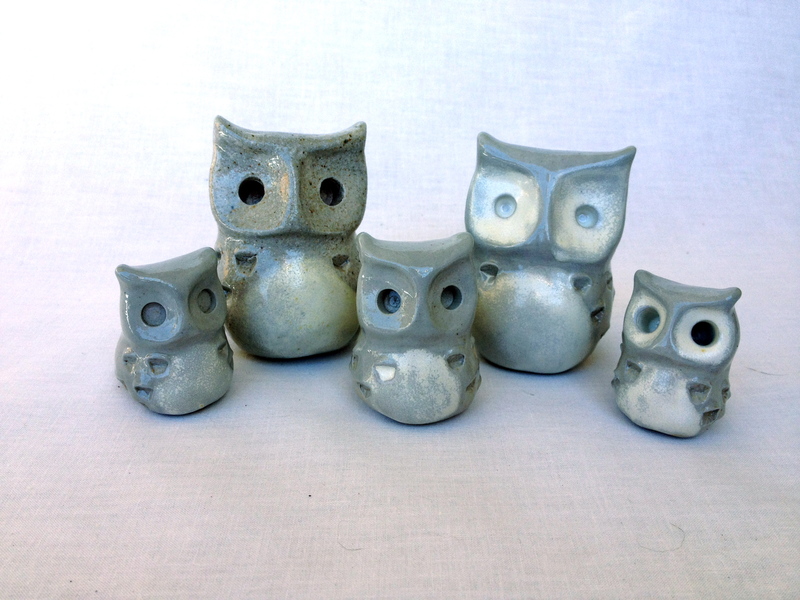 After he build the glaze test kiln he even invited his friends over for a party while it fired. Watching him work encouraged me to take the time for the small details on my work which make it look polished. 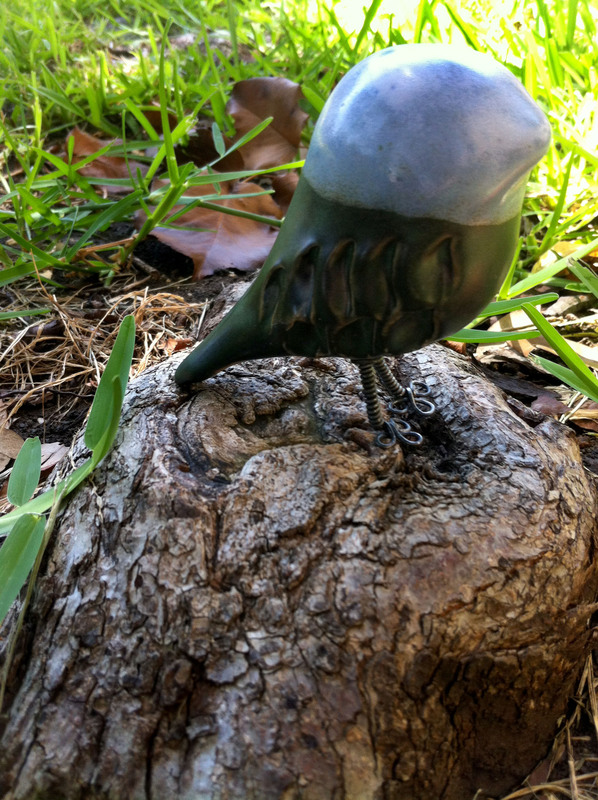 These small details have been incorporated into my latest pieces. 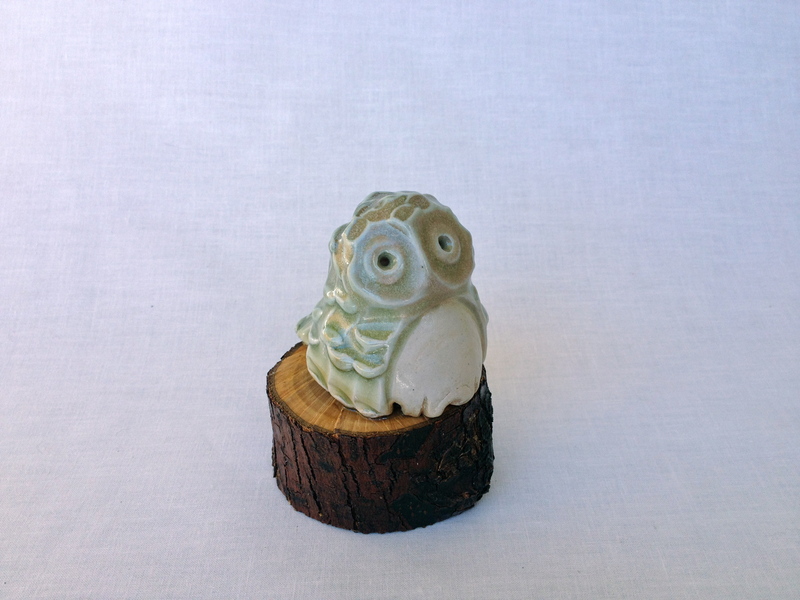 My new favorite is using a squared dowel rod to create ridges or ruffles on my pieces. 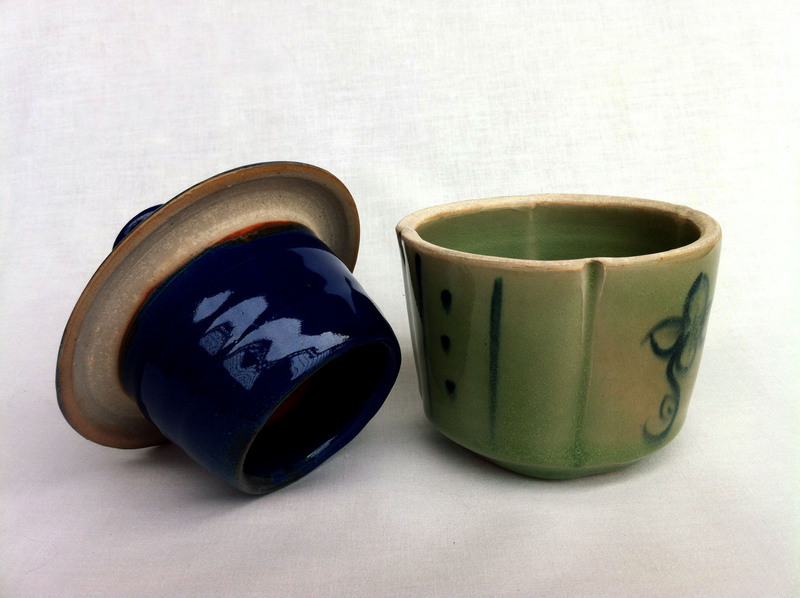 I have almost obsessively incorporated them into my tea bowls, large bowls, and jars. 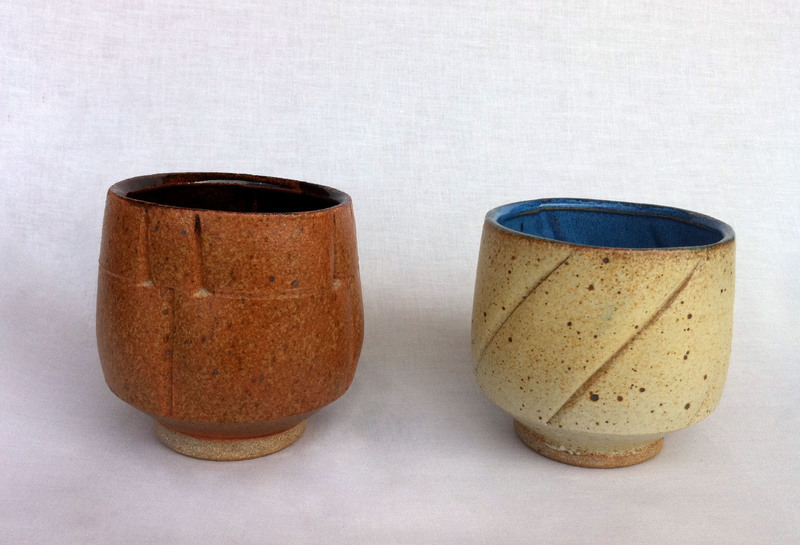 The feet on my pieces have also improved thanks to his demonstrations showing how much the detail improves its sharpness.The tea bowls in the picture above show Jeffery’s use of a cheese cutter and dowel rod for decoration. 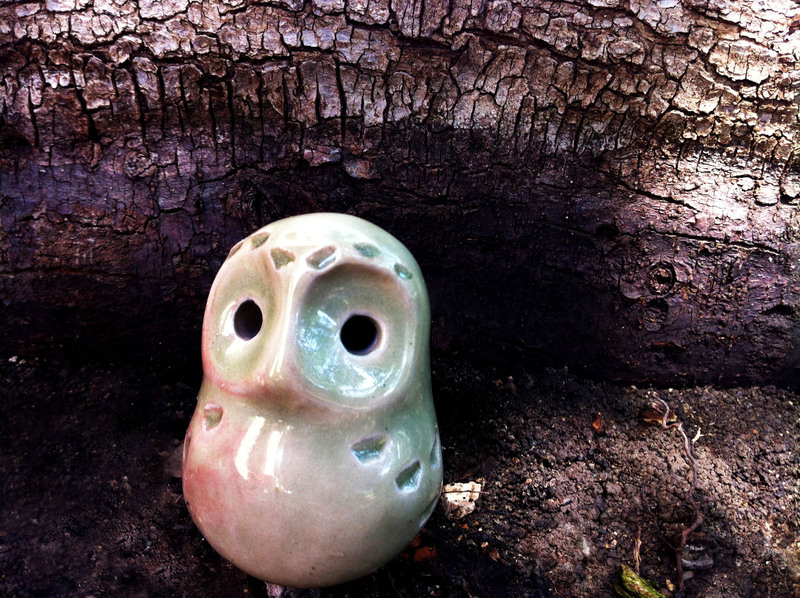 Observing the purposefulness and mastery of how Jeffery work has inspired me and changed the way I work. 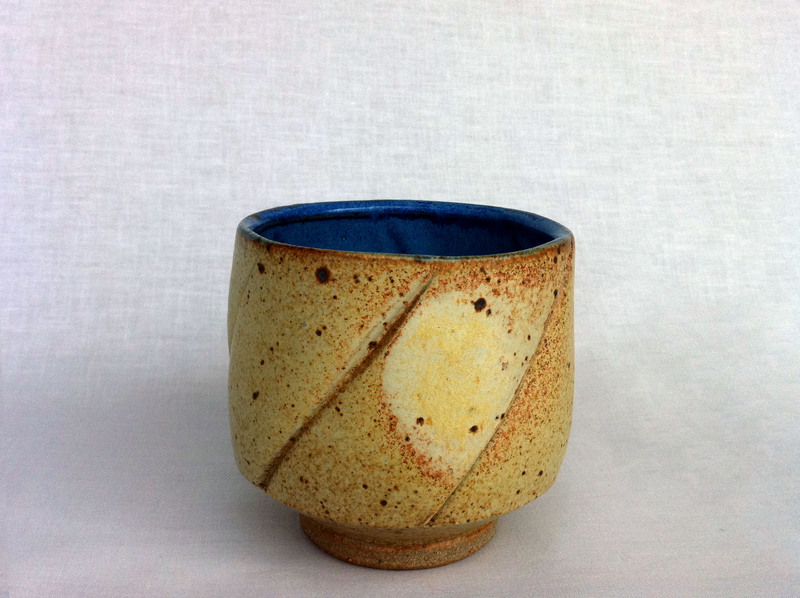 As I post my new work I hope you will see this change reflected in my work. 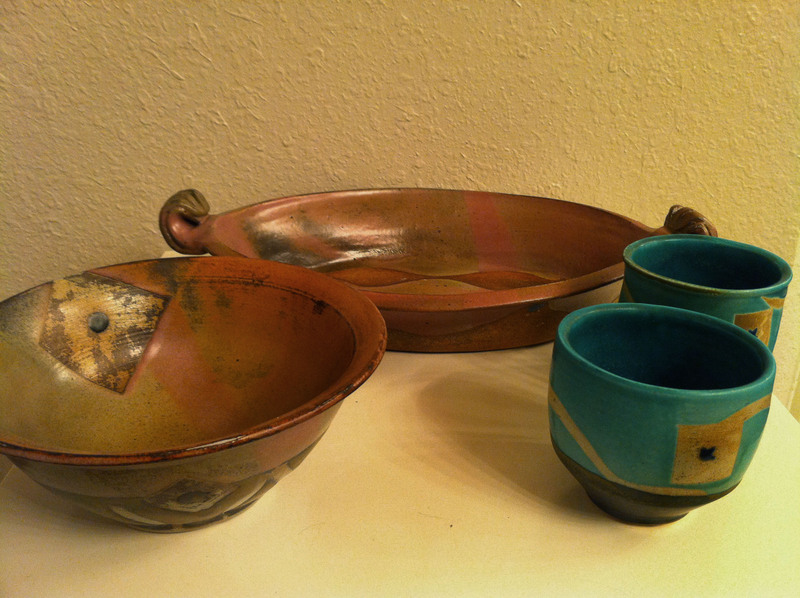 The pieces below are actually mine! 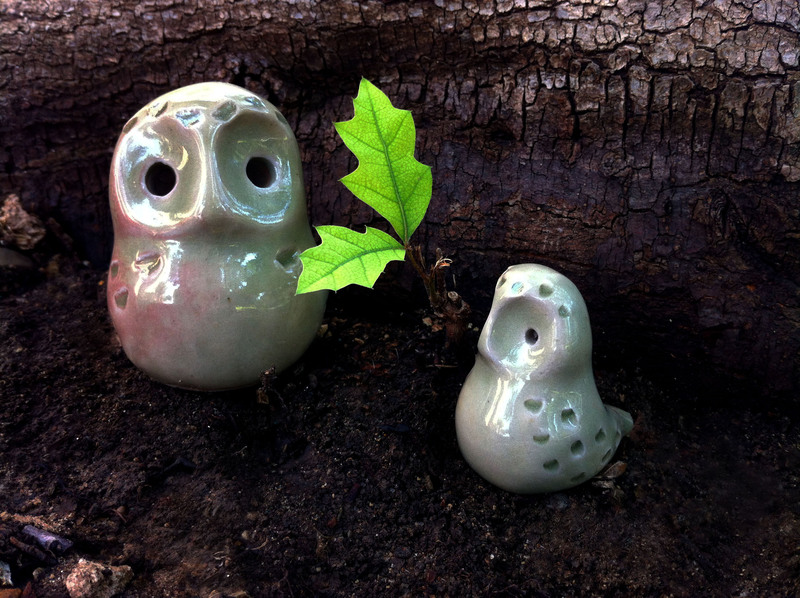 Adventures into Making Large Owls!